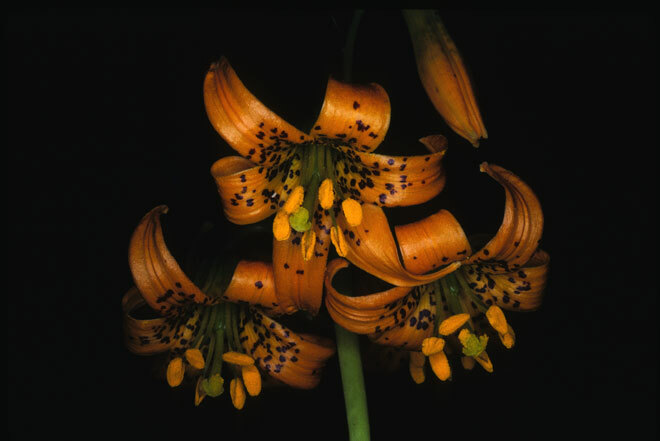 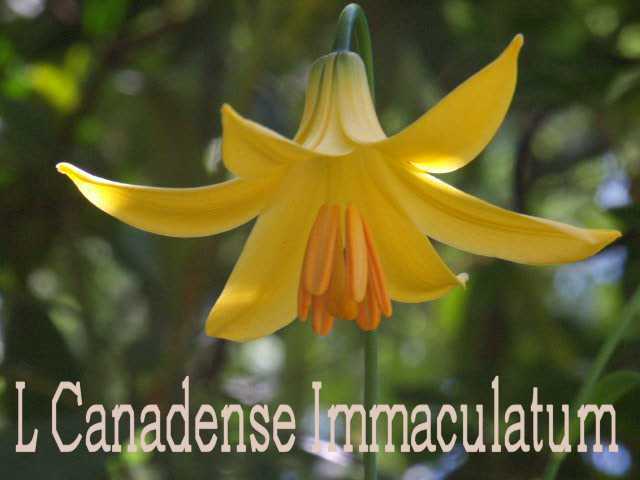 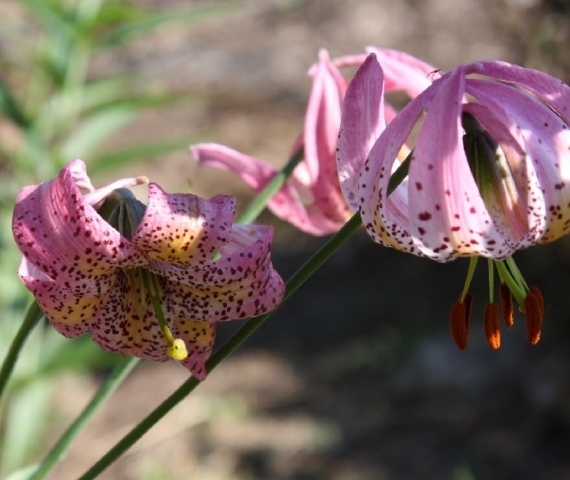 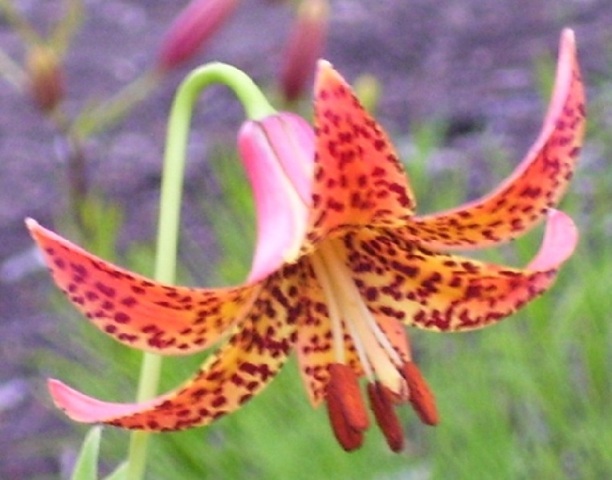 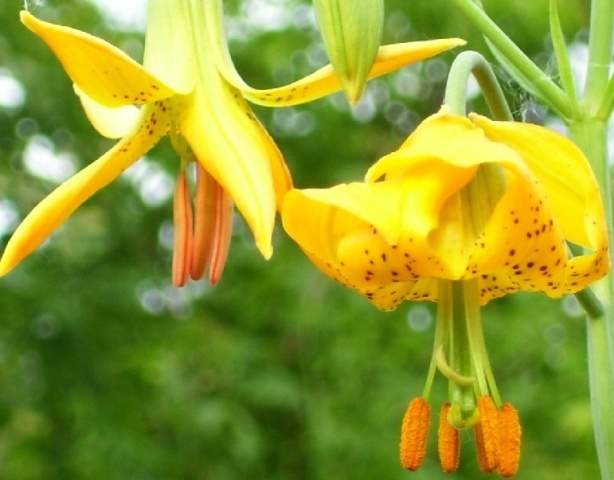 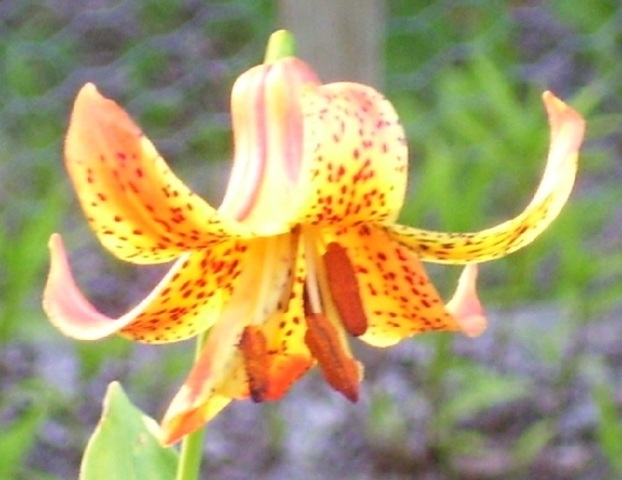 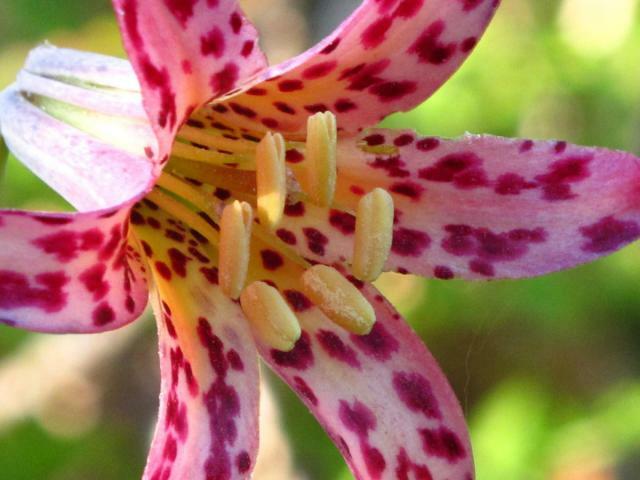 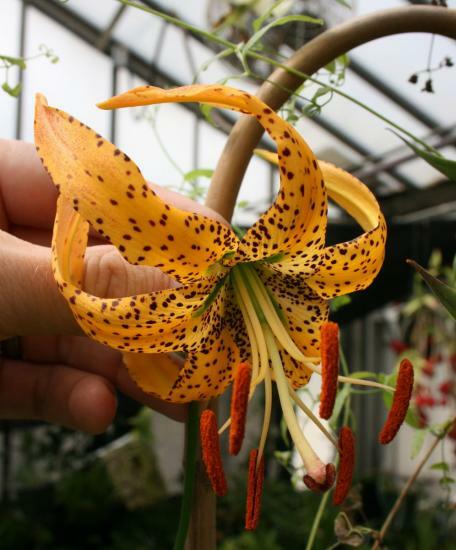 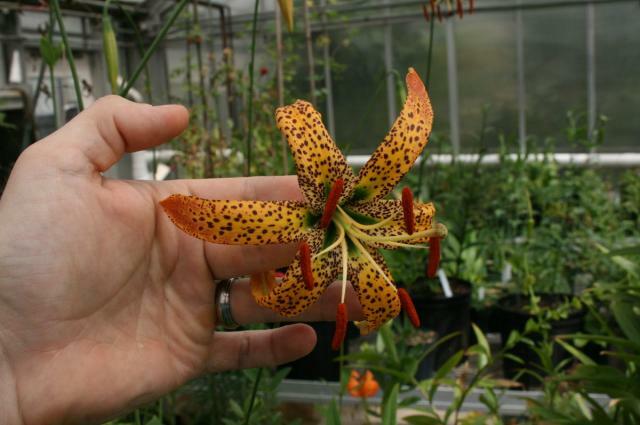 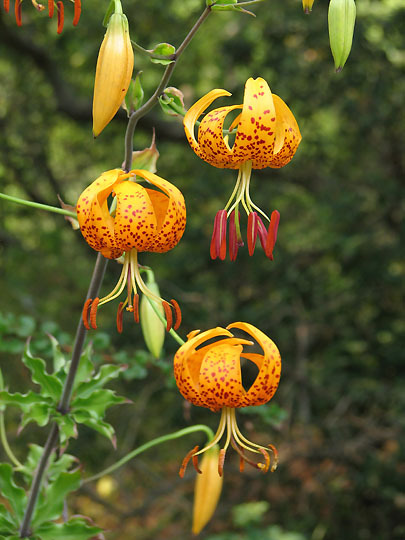 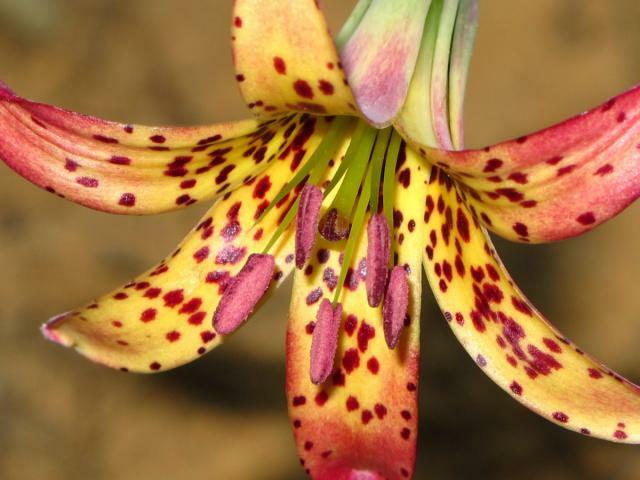 Species Lilium that originate in North America from A-M are found on this page. 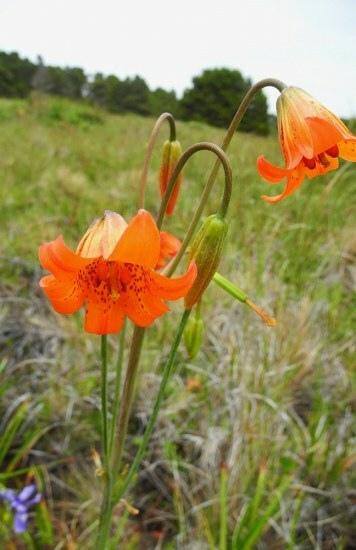 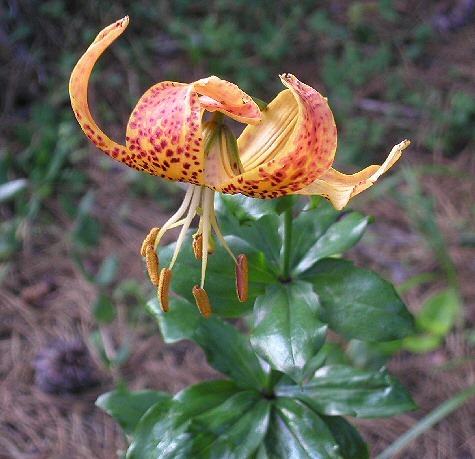 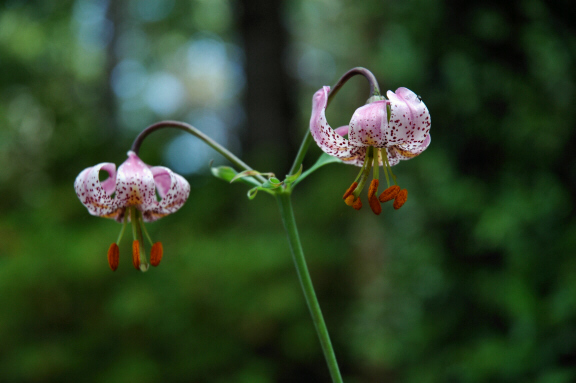 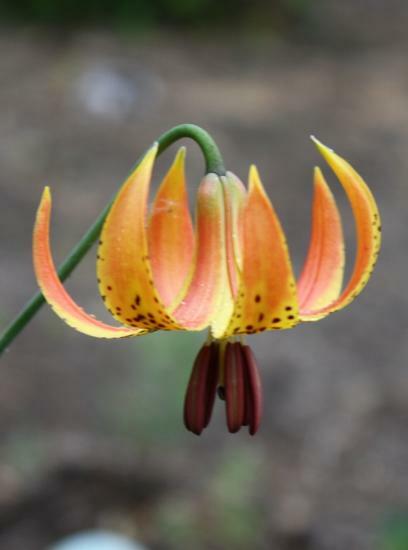 Lilium bolanderi S.Watson, Bolander's Lily, is found in the Klamath ranges of California and into SW Oregon, elevation 150-1600 m. Photos by Ron Parsons from wild populations in Humboldt County, CA. 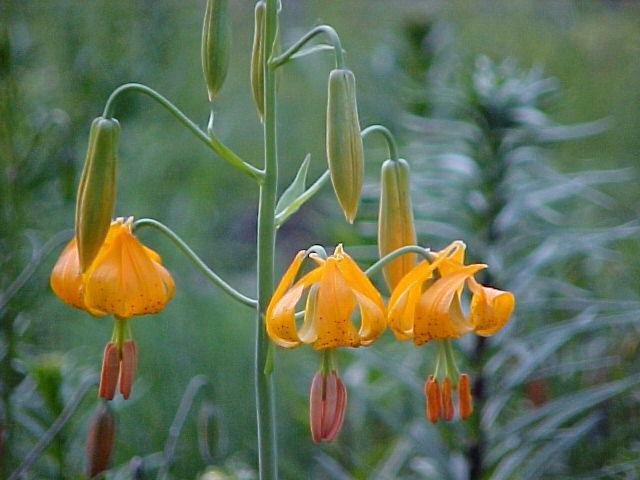 Photographs by Rimmer de Vries taken on the 17th and 19th July 2010 in the South Siskyou mountains in North West California East of Crescent City. 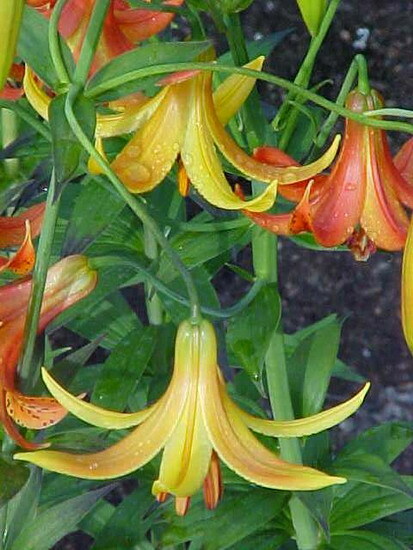 Lilium canadense L. is native to the east coast of Canada and parts of the New England States and can reach well over 6 feet in height, with 20 flowers per stem on long pedicels, with lemon yellow pointed tepals with dark purple spots. 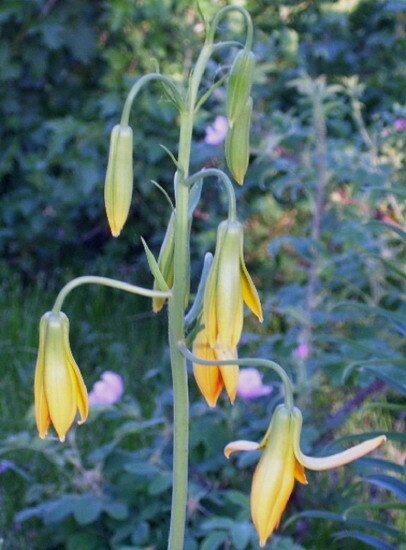 The flowers become bell shaped as they mature. 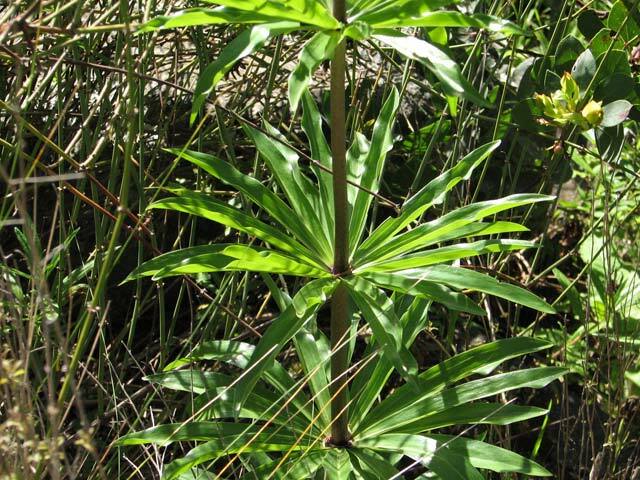 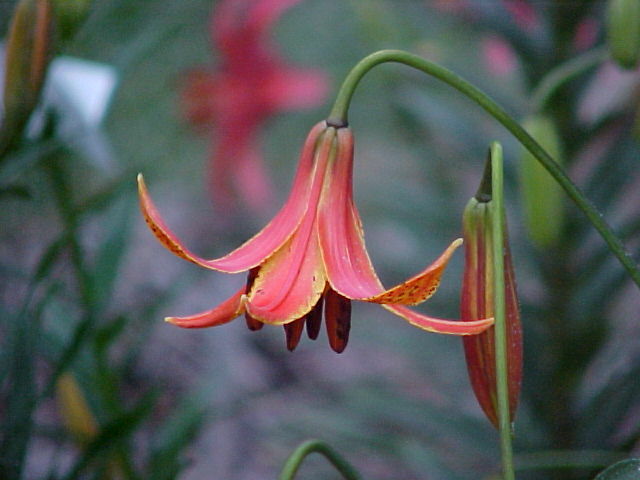 This lily likes to grow on the edge of woodlands where it can obtain a little shade. 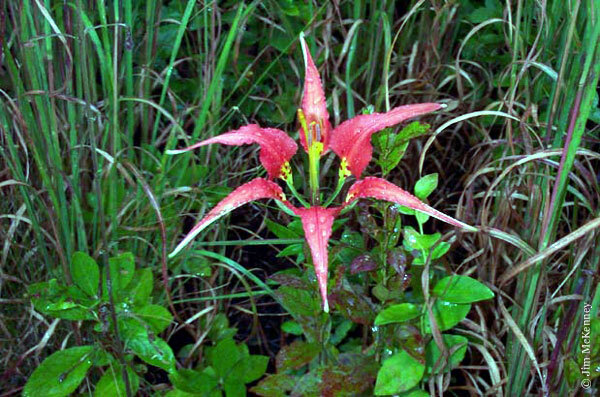 Photos 1-3 were taken by Ron Moodycliffe. 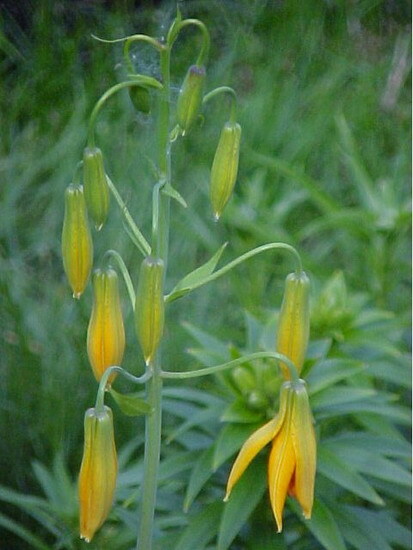 Photos 4-5 were taken of plants in situ in Vermont by Ron Parsons. 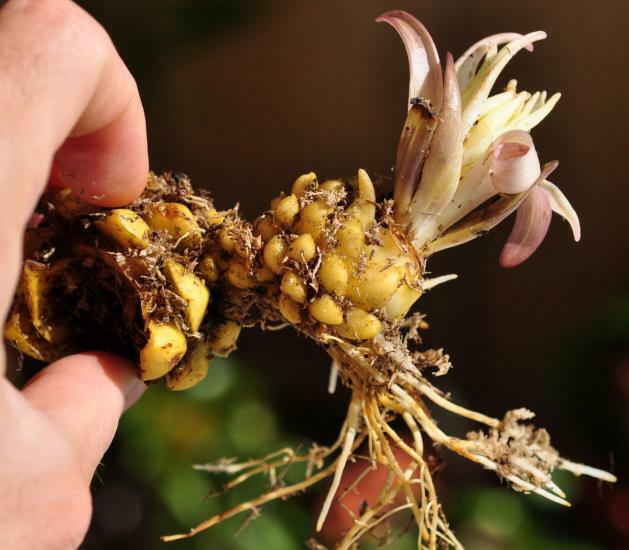 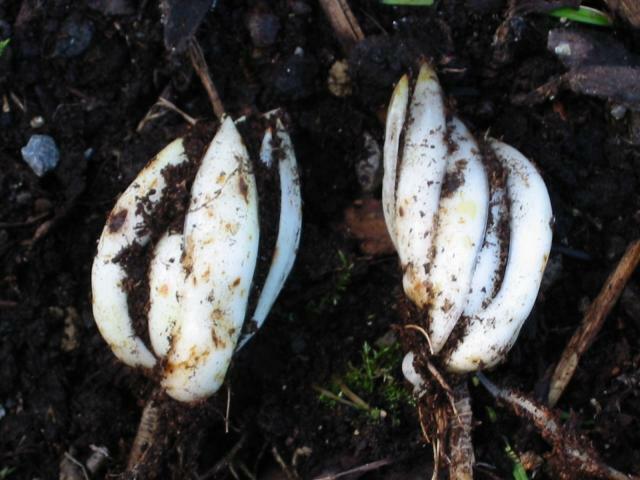 Photo 6 illustrates the bulb, which is growing at the end of a thick stolon, by Janos Agoston. 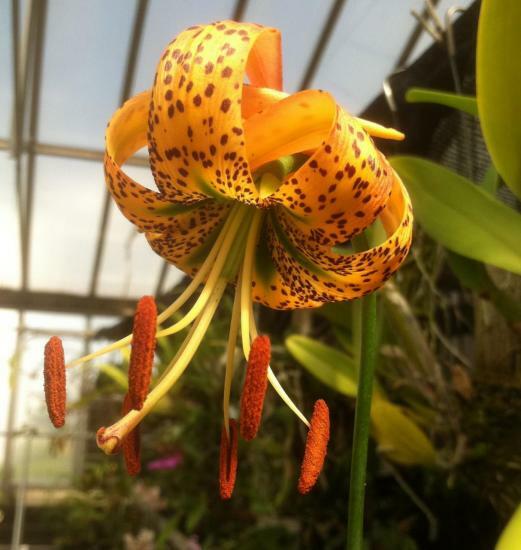 Photos below submitted by Darm Crook. 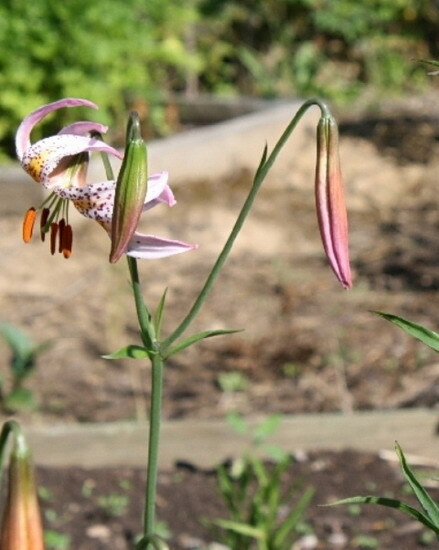 Lilium canadense var. 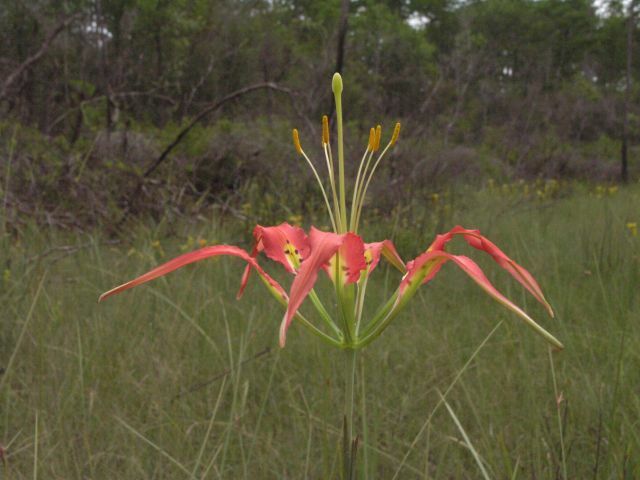 coccineum (Pursh 1814) is a variety not recognized by all. 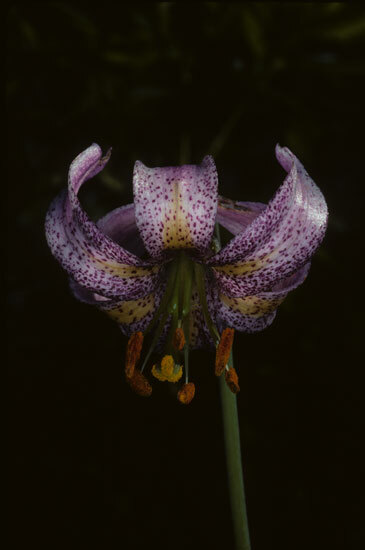 Two views in photos 1 and 2 from Arnold Trachtenberg; reverse of tepals are alternate in appearance. 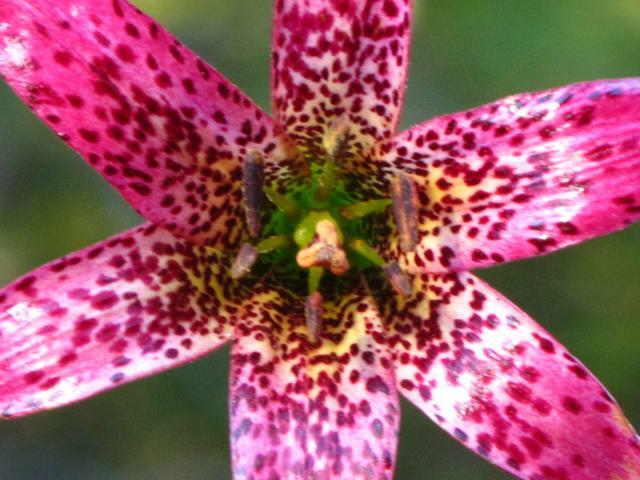 Photos 3-5 submitted by Darm Crook. 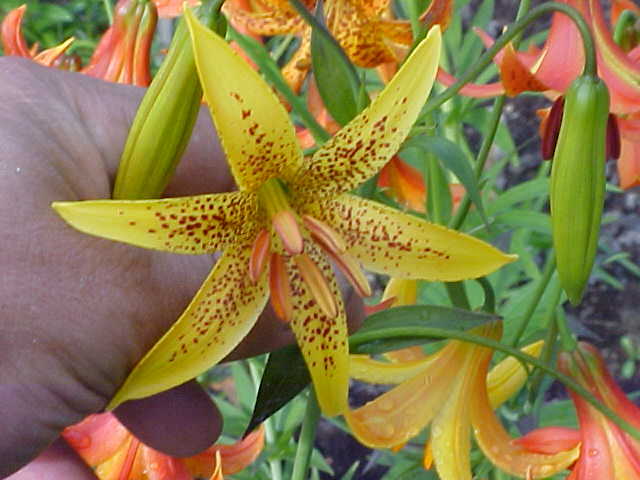 This variety has extreme colour variations, from almost pink, to light orange, crimson, dark orange plus bi-coloured reverse of orange and yellow, the spotting patterns have just as much variation, from almost nothing to very heavy. 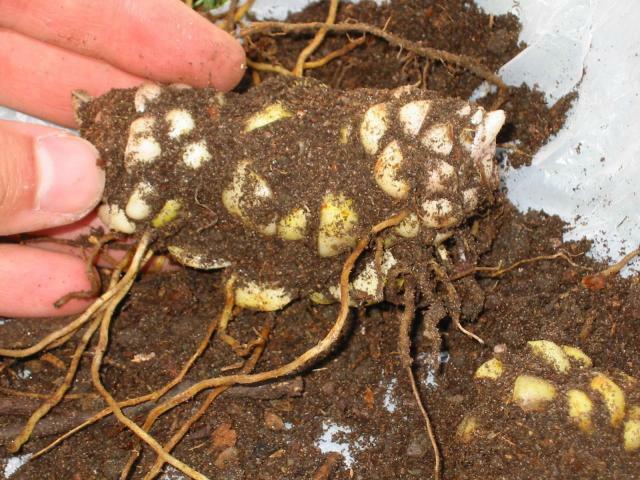 Photo 6 of a bulb Pontus Wallstén. 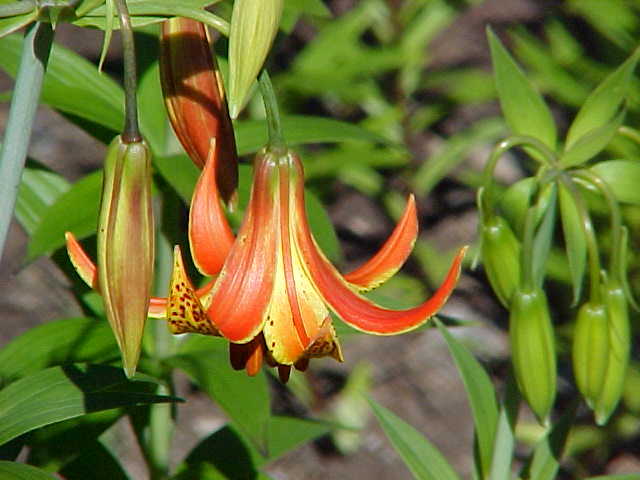 Lilium canadense var. 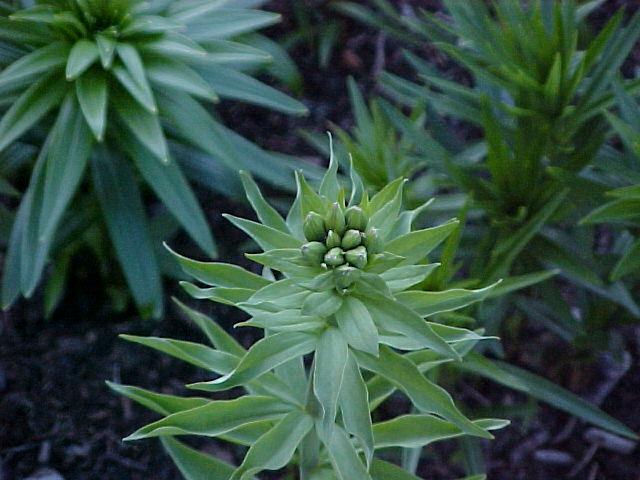 flavum (Pursh 1814) is another variety not recognized by Kew. 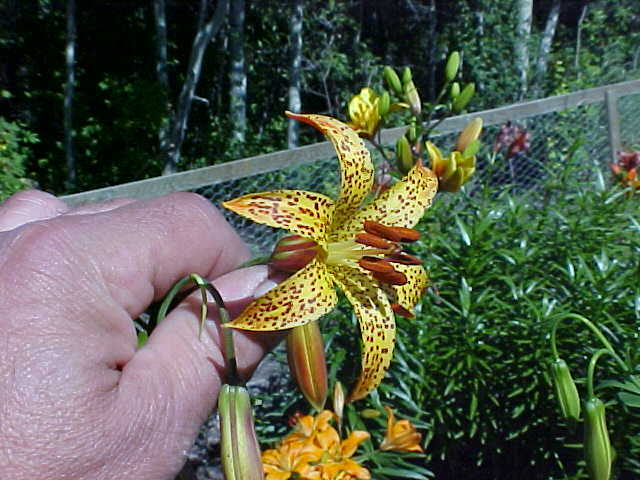 This variety has yellow flowers spotted crimson to brown. 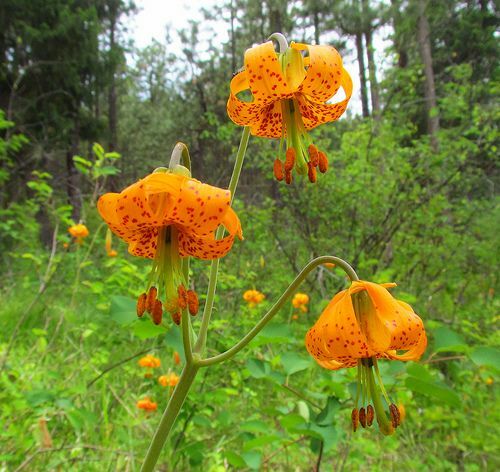 Photos submitted by Darm Crook. 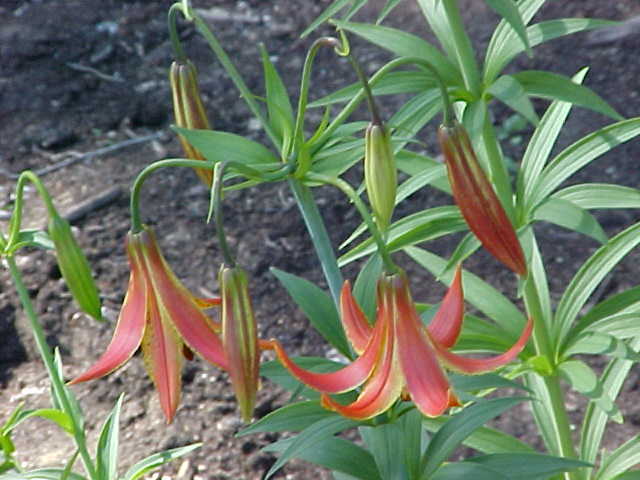 Lilium catesbaei Walter from southeastern North America, requires conditions which would kill most lilies: wet, hot, acidic soil. 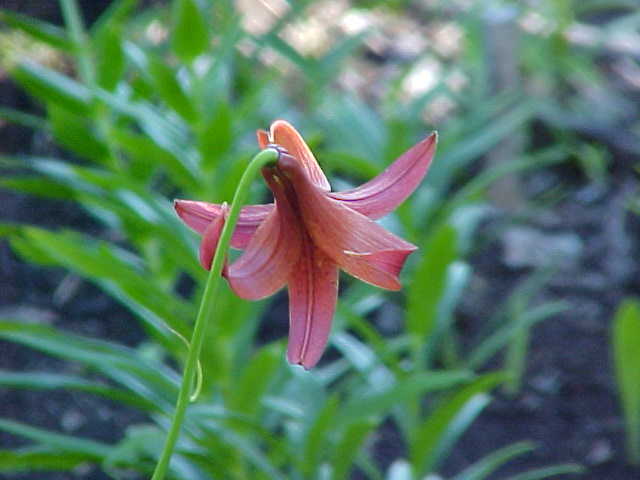 It generally blooms late in the year and typically there is only one flower. 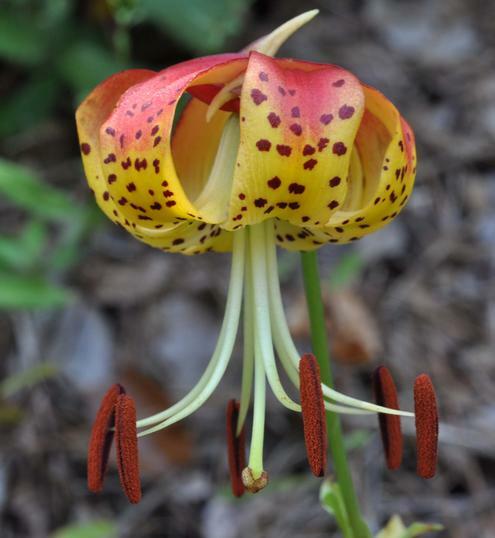 Grown by bog plant guru John Hummer and photographed by Jim McKenney. 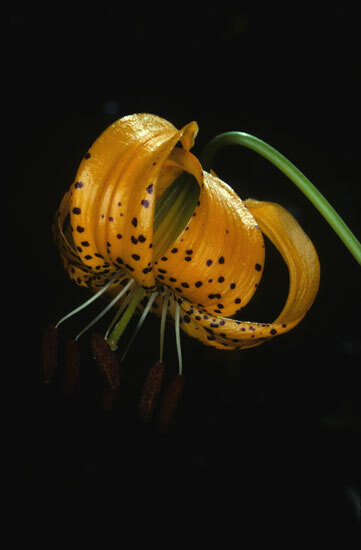 Two forms are shown here. 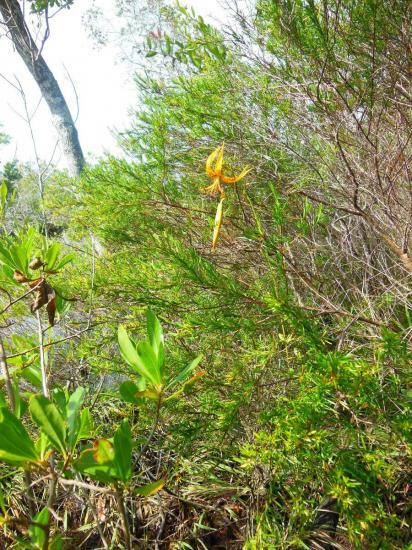 Anecdotal evidence suggests that the plant with spidery flowers originated in northern Florida. 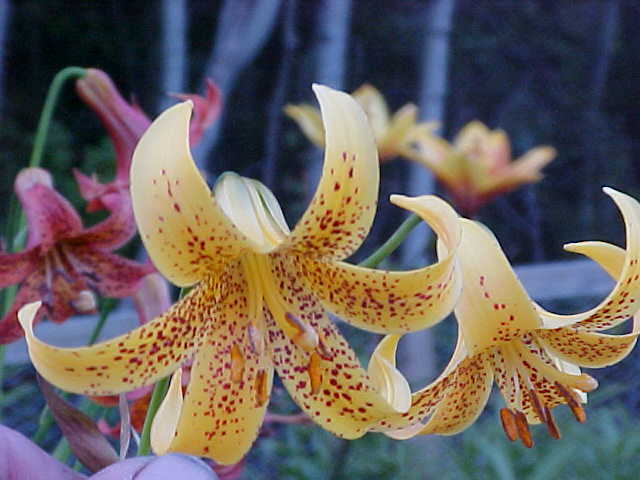 The one with broader tepals purportedly came from coastal North Carolina. 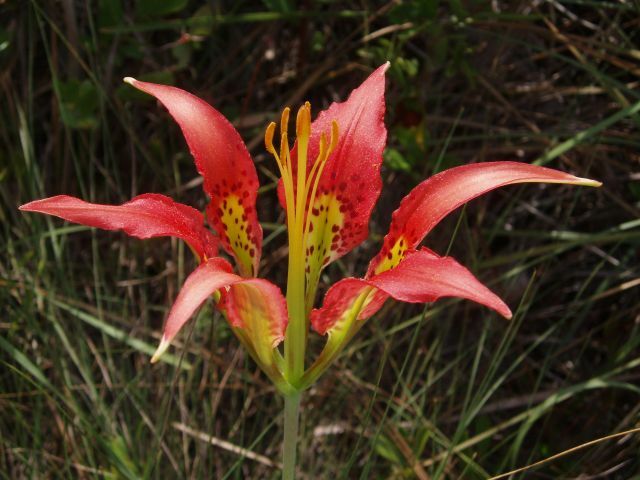 Variance of wild plants from adjacent Bay, Gulf, and Liberty Counties in the central panhandle of Florida. 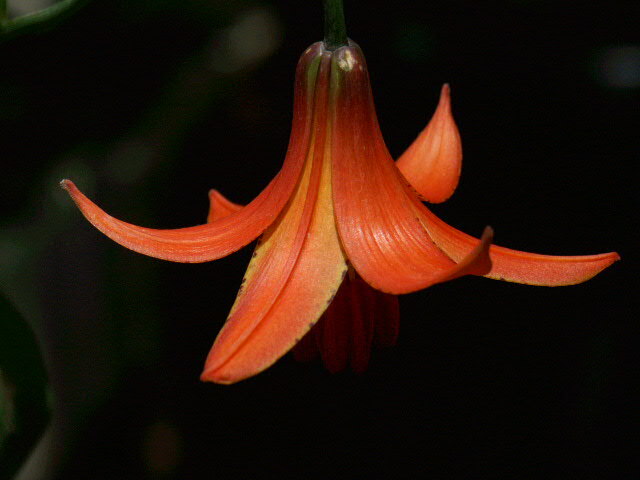 Photos by Alani Davis. 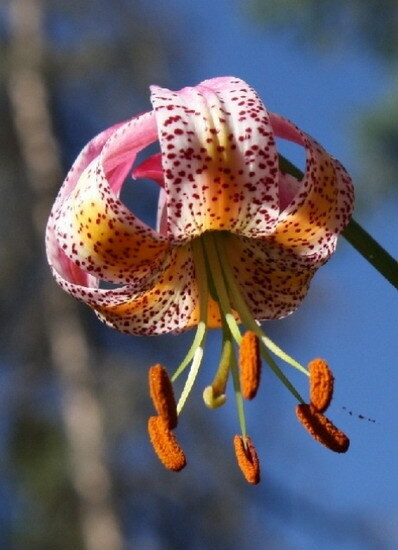 An ananthocyanic form found in the Florida panhandle. 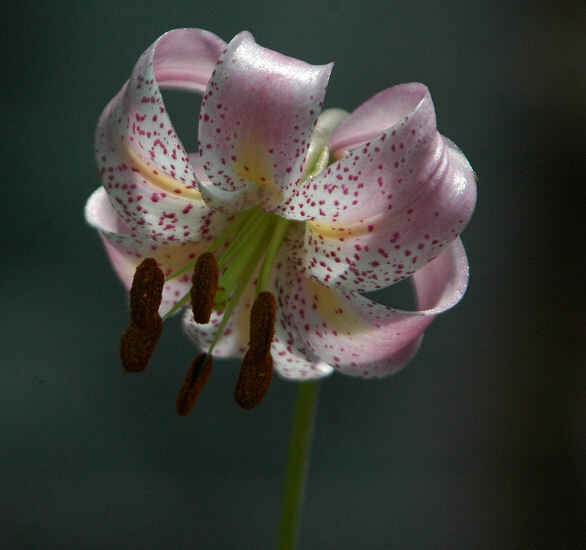 Photos by Alani Davis. 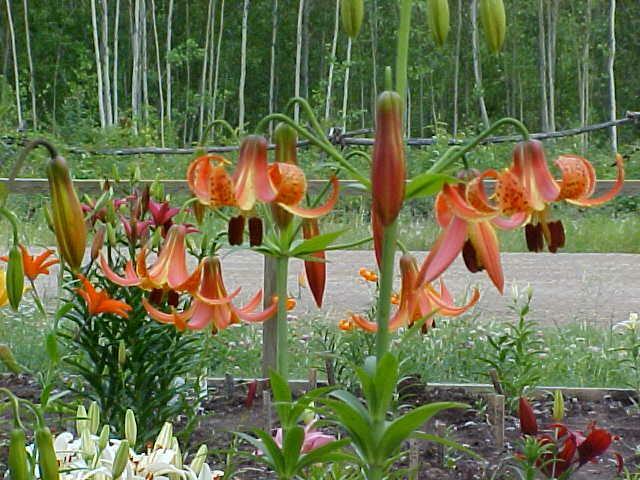 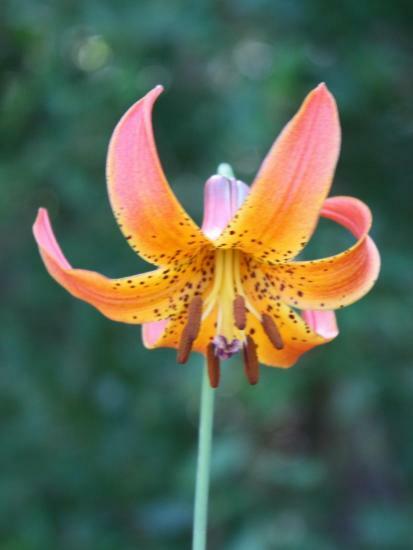 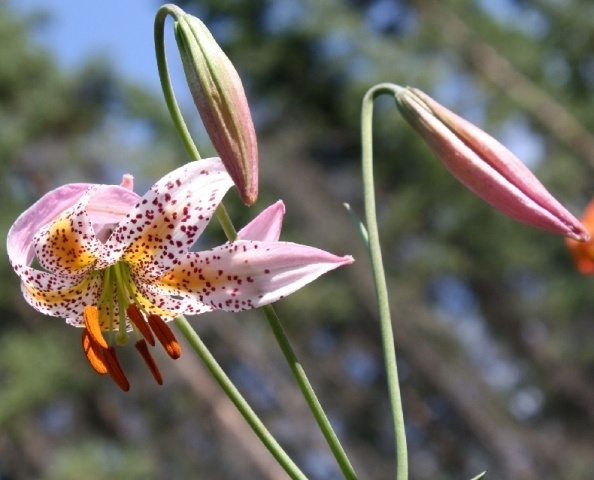 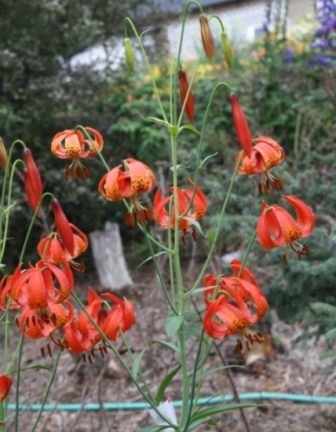 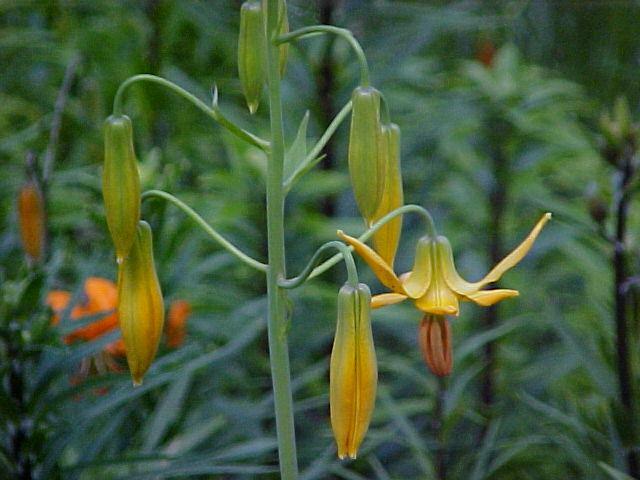 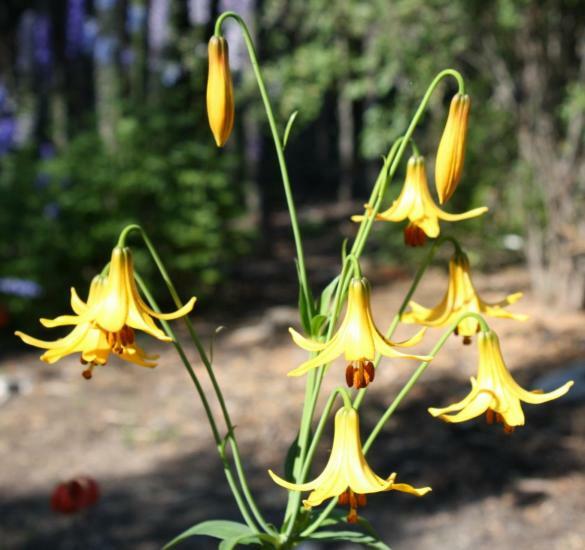 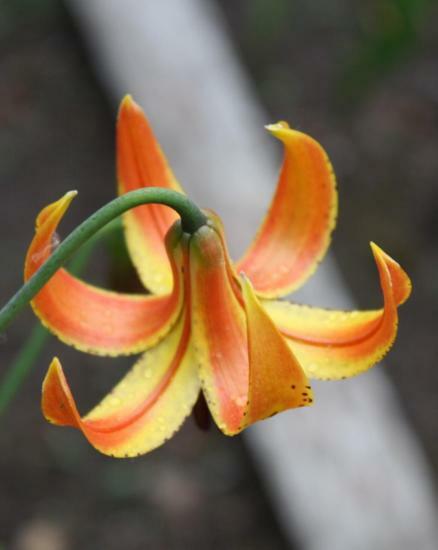 Lilium columbianum Leichtlin grows from Northern California north to Canada. 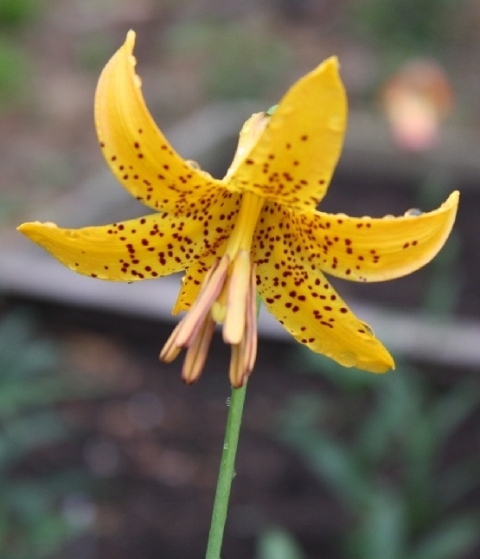 Flowers are golden yellow to bright orange with dark purple spots or blotches and up to 30 flowers per stem. 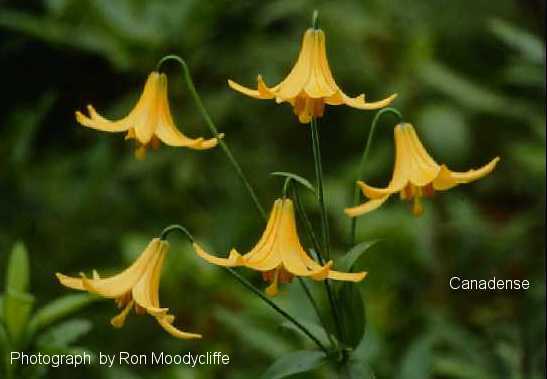 In photo 1 by Ron Moodycliffe the flowers are golden yellow. 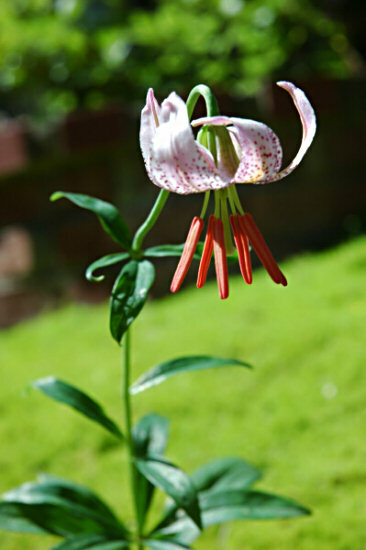 Photos 2-4 are from Richard Haard. 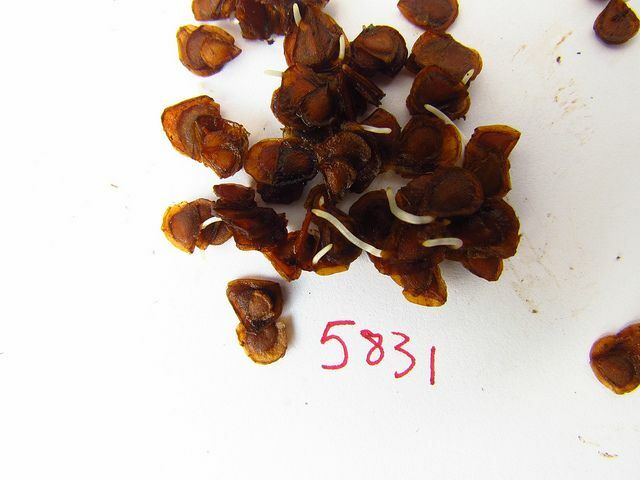 The last shows germinating seeds: 30 days warm strat (50 °F) then 2 weeks cool (40 °F). 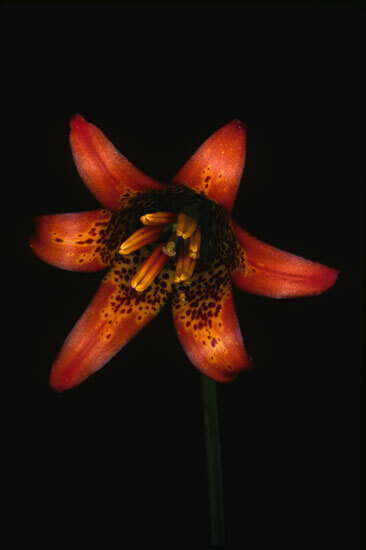 Photo 5 of a bulb by Pontus Wallstén. 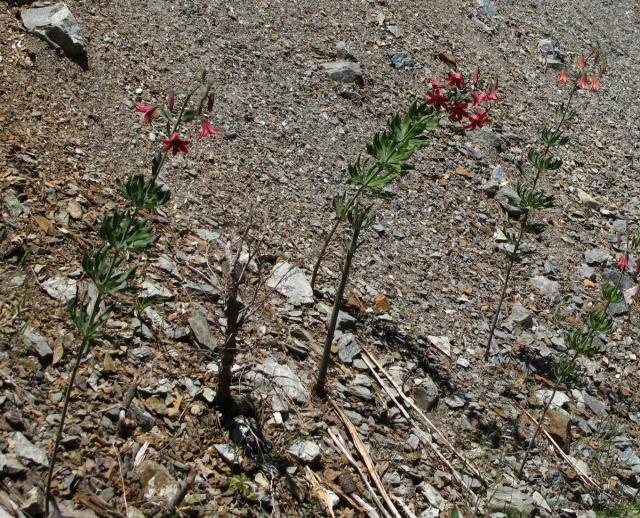 The first three photos by Bob Rutemoeller show plants growing in mass along the highway in Northern California. 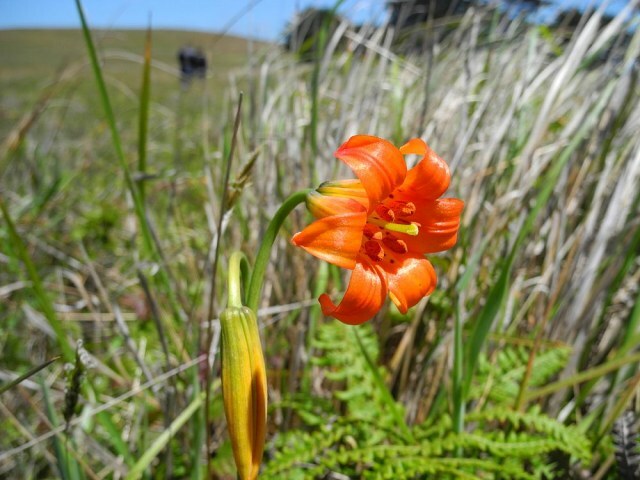 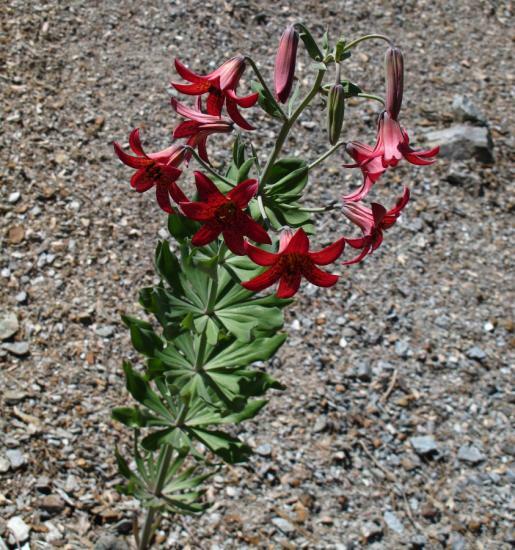 The last three photos from Ron Parsons show more plants in the wild, found in Douglas County, Oregon (photos 4,5) and along highway 101 Del Norte County, California (photo 6). 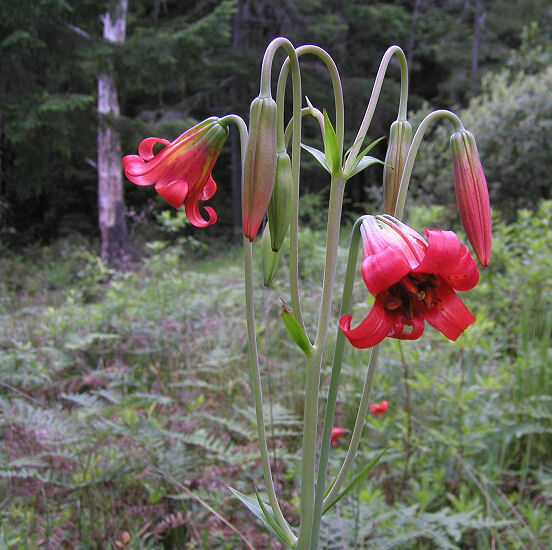 This species grows into British Columbia (BC) Canada and continues north through the BC interior with its last known site in BC being around Ft. Saint John. 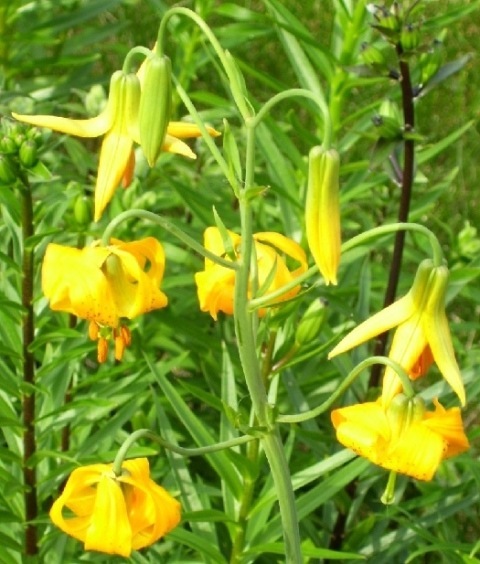 It also grows north of the last known BC site in the Yukon Territories Canada on the Liard Plato. 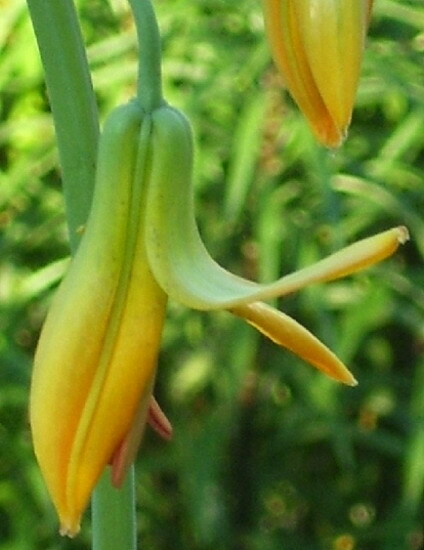 The florets are held on arching pedicels in a raceme inflorescence. 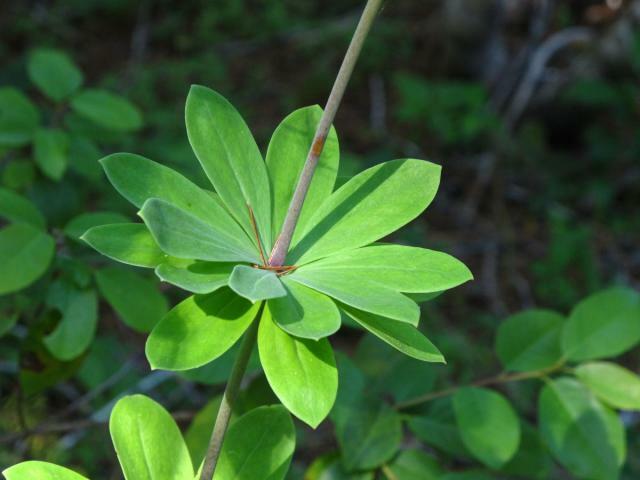 In Hay River there are stems that have produced up to eighteen florets. 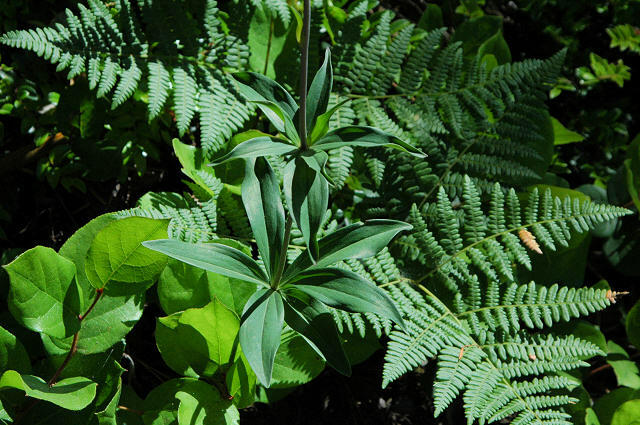 The foliage is set in whorls; some of them can be partial whorls. 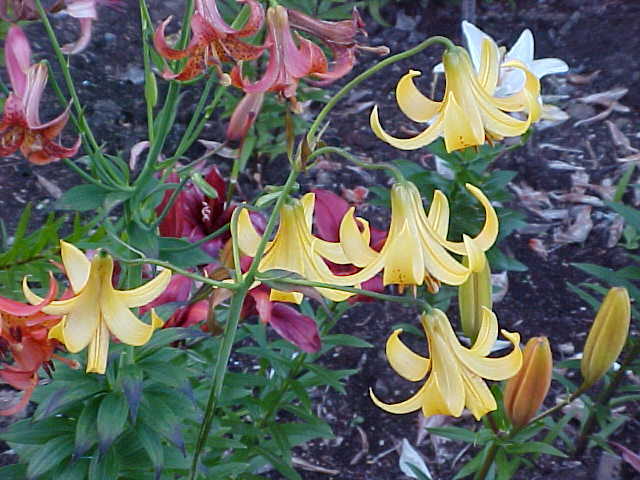 The colour varies from orange to a light yellow. 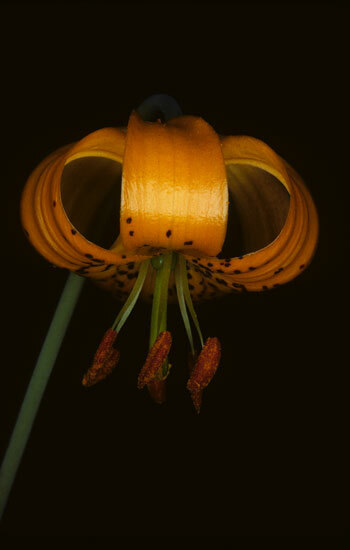 Nine photos of two colour forms submitted by Darm Crook. 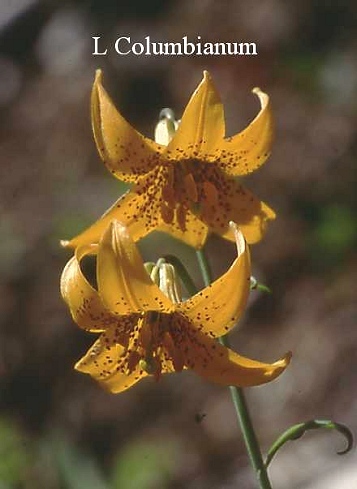 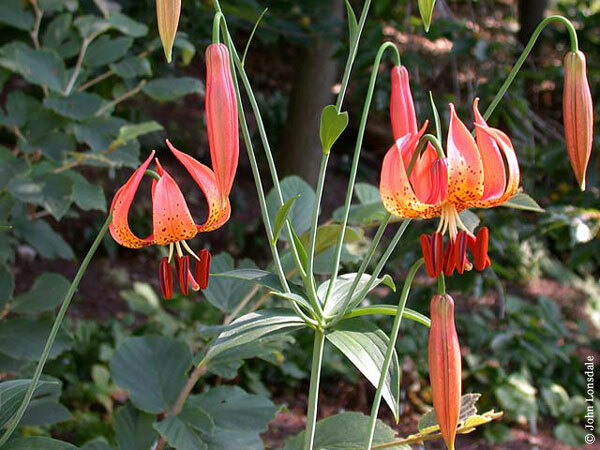 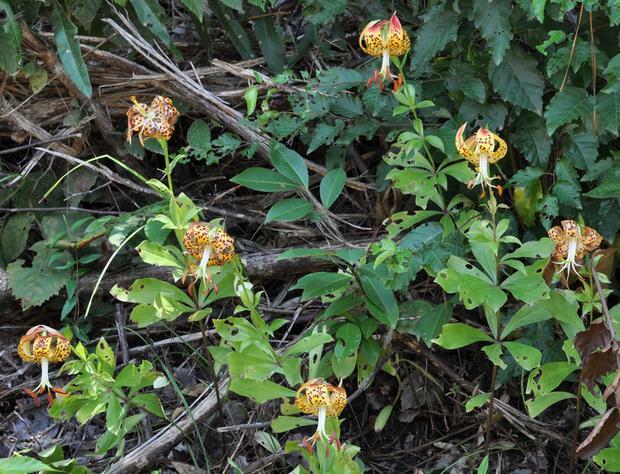 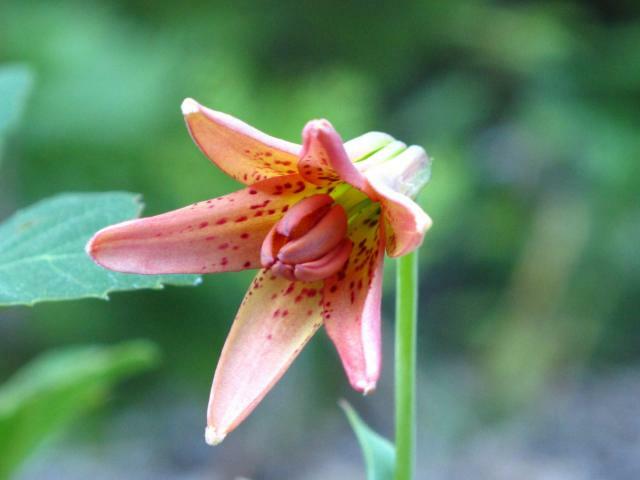 Lilium grayi S.Watson is found at scattered sites in the mountains of western Virginia, North Carolina and Tennessee. 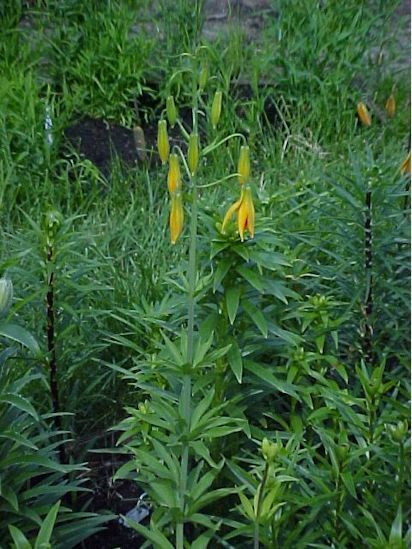 Rarely seen in gardens in the eastern states and seems to grow more freely in cooler northern areas. 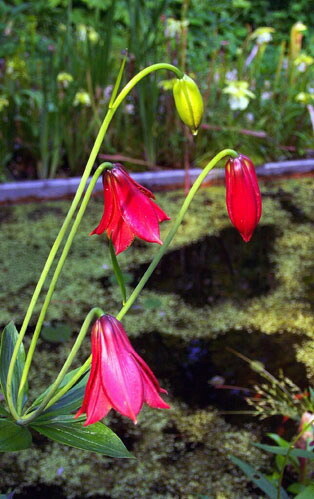 Photo 1 by Wayne Crist of a plant grown by Jim McKenney in his bog trays, with Sarracenia in the background. 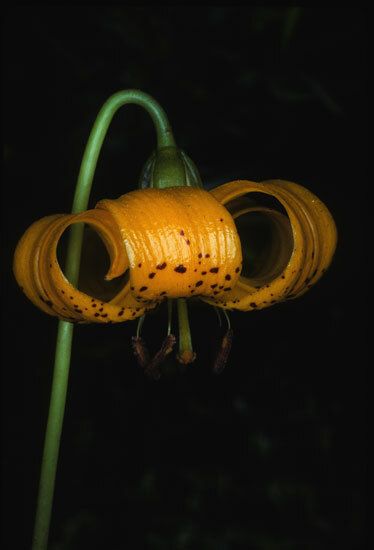 Photo 2 of a bulb by Pontus Wallstén. 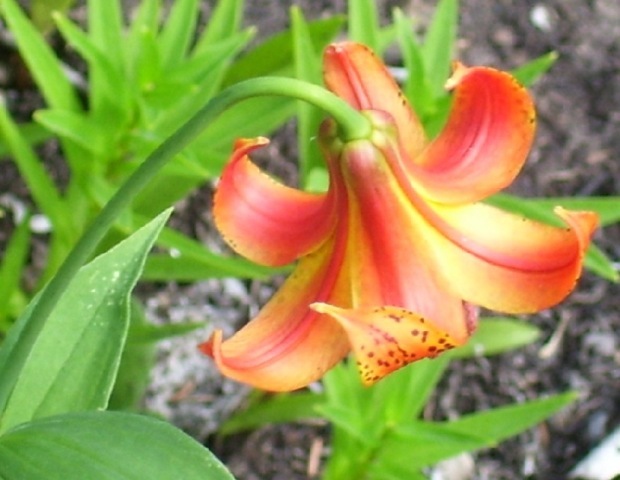 Lilium humboldtii Roezl & Leichtlin ex Duch. 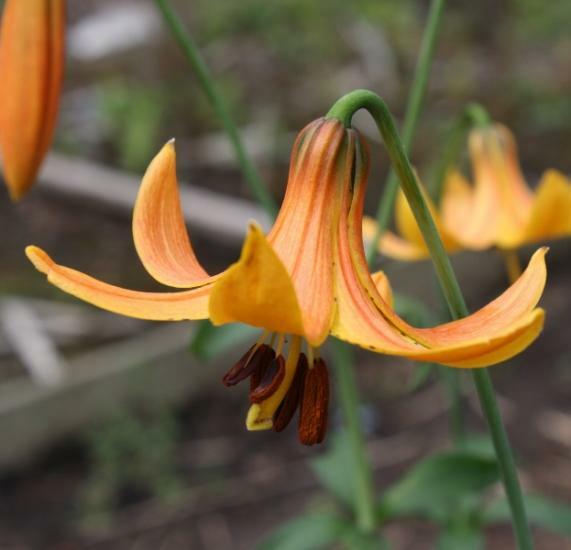 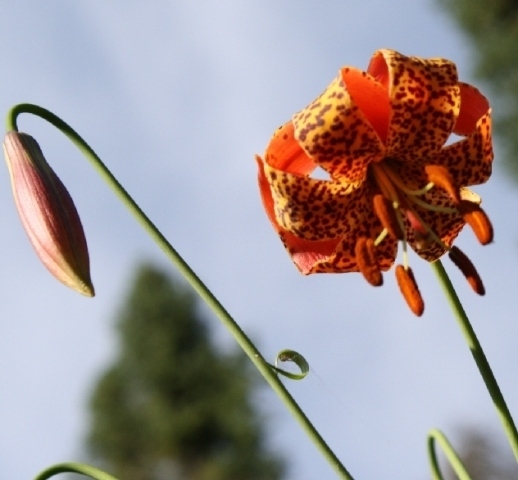 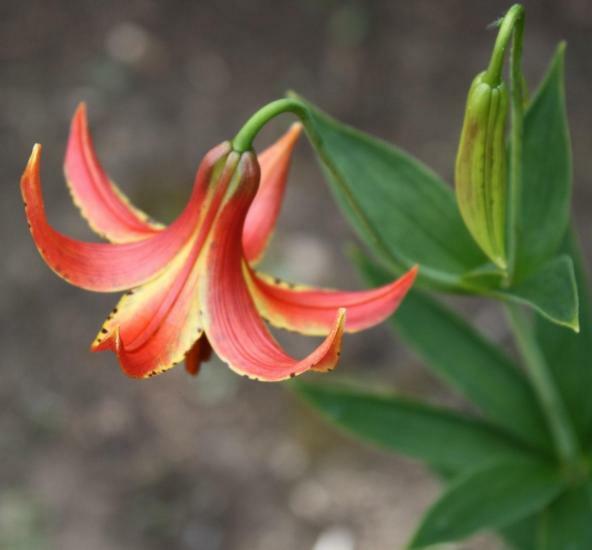 see the Lilium humboldtii page. 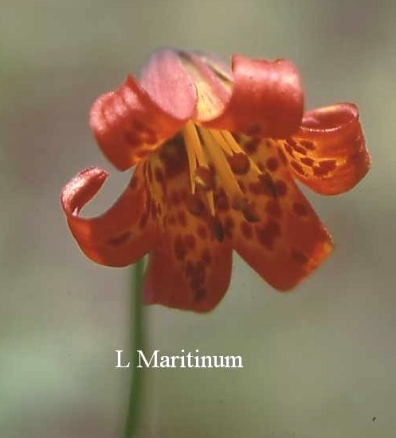 Representative photos of this species by Mary Sue Ittner, Ron Parsons, Nhu Nguyen and Jim Duggan. 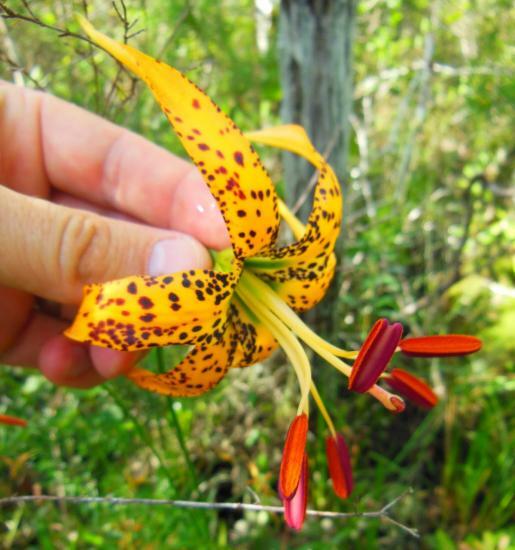 Lilium iridollae M.G.Henry is native to the Florida panhandle and a few adjacent Alabama counties. 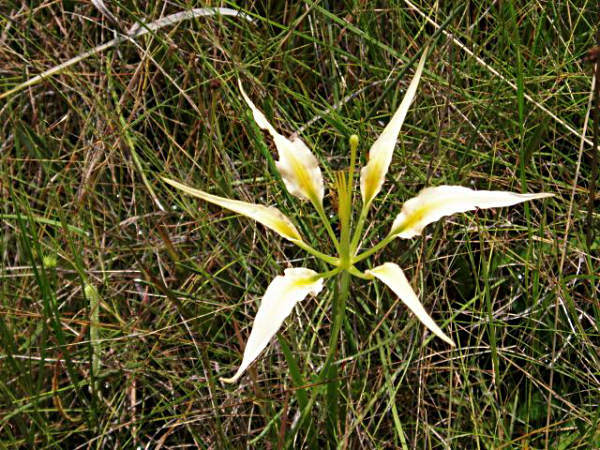 In the wild in grows in two distinct habitats: seepage bogs in otherwise dry, upland pine (Pinus palustris) forest and wet, organic soils of the riparian zone of the unique "blackwater" rivers characteristic of this region. 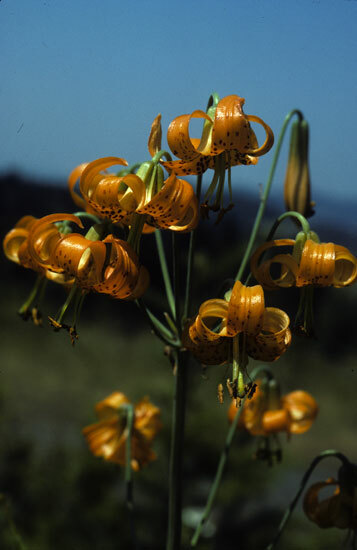 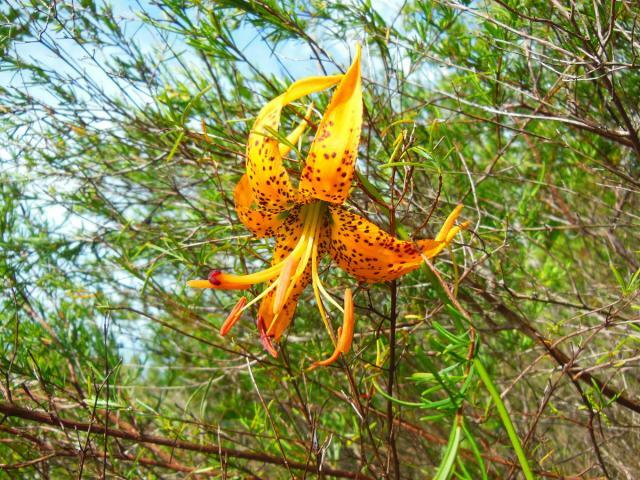 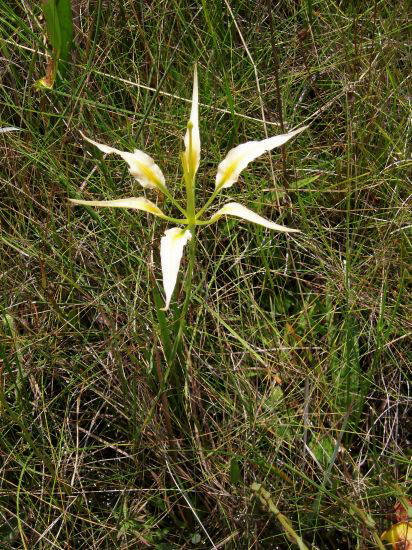 Both habitats are extremely wet, but in the latter habitat Lilium iridollae may occur in estuary areas and may become inundated with brackish water during tidal fluctuations. 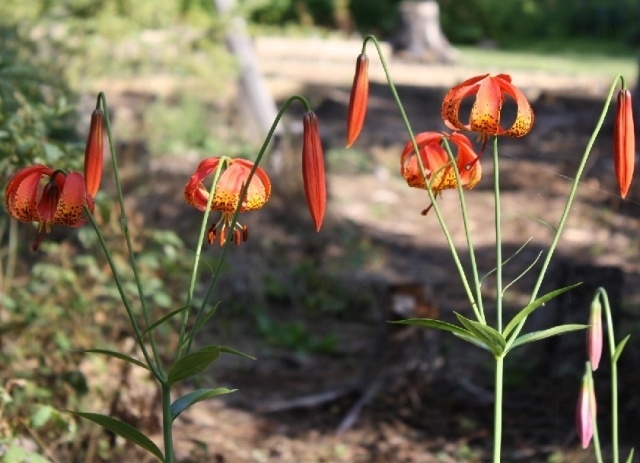 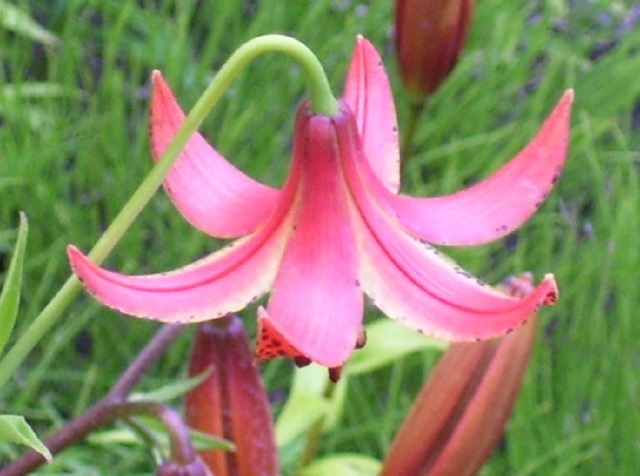 Lilium iridollae has been regarded as difficult, if not impossible, to grow in cultivation but seed germination and cultivation experiments indicate that it is easy to grow in bog gardens and containers with a medium that suits Sarracenia, Drosera, and other carnivorous plants that are common companions of Lilium iridollae in the wild. 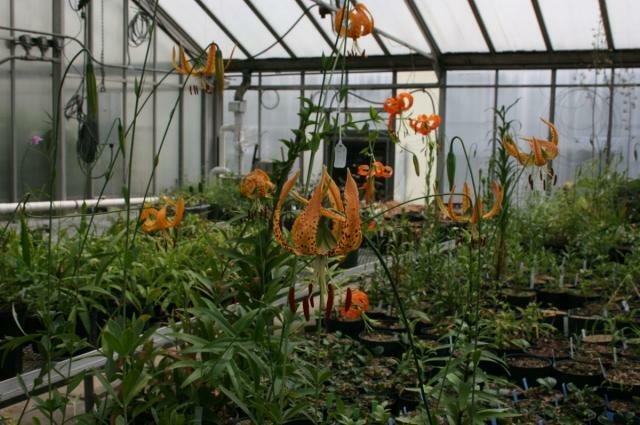 Pictures shown here, taken by Peter Zale, are of plants in the wild (first row) and in cultivation in a greenhouse in central Ohio, USA. 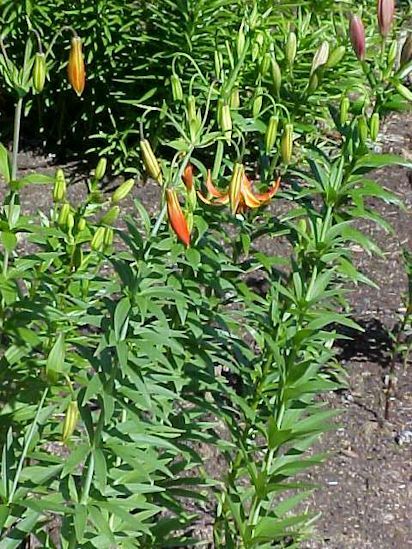 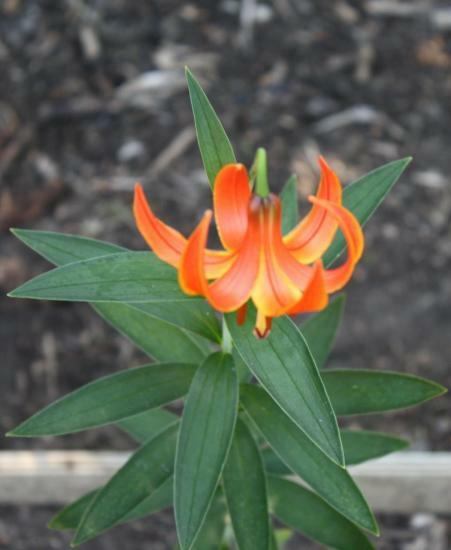 So far, initial reports indicate that Lilium iridollae is cold hardy to USDA zone 5 when proper soil and moisture conditions are provided. 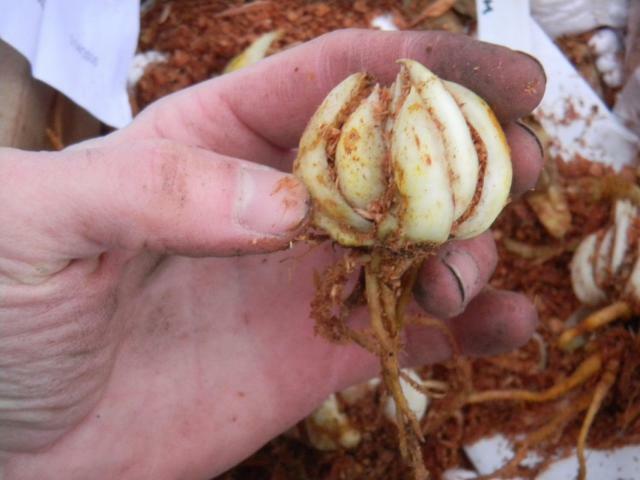 Photo of a bulb by Pontus Wallstén. 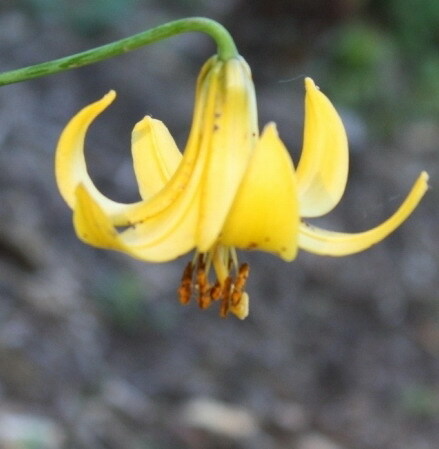 Lilium kelleyanum Lemmon from the southern Sierra Nevada Mountains, eastern side, 8-9500'. 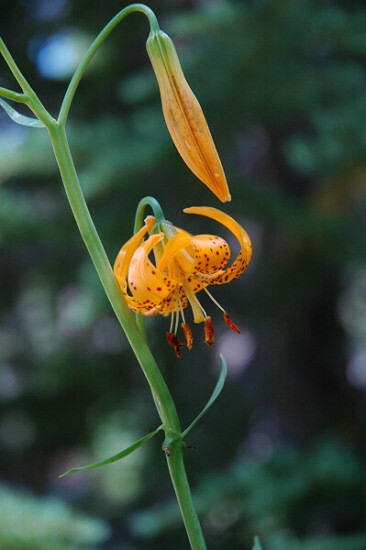 Photo 1 by John Longanecker. 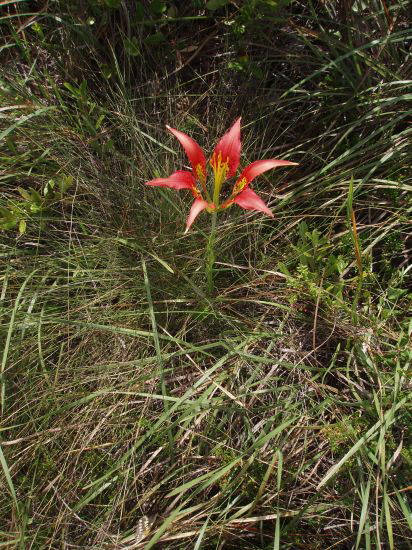 Photos 2-3 by Ron Parsons, wild population Fresno County California, early July 2006. 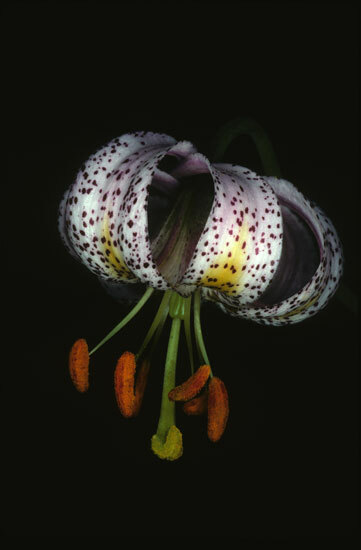 Photo 4 of a bulb by Pontus Wallstén. 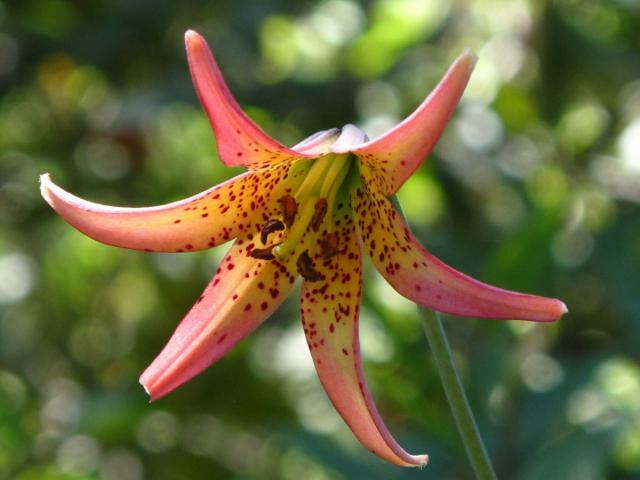 Lilium kelloggii Purdy from the redwood region of Northern California to Southwest Oregon, growing on dry slopes with wet winters and some summer moisture from fog. 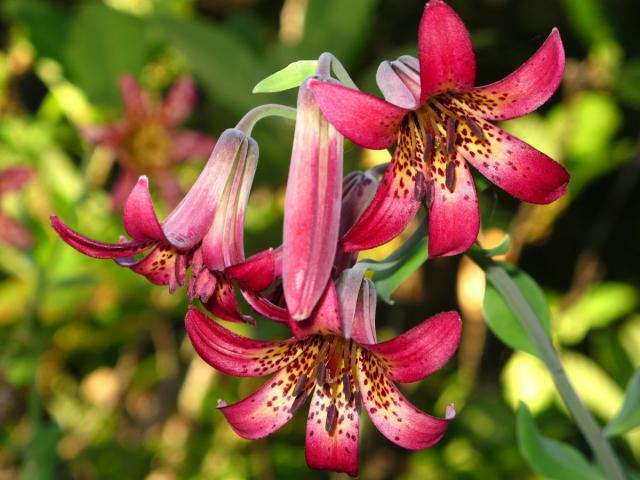 The flowers appear in June and have a soft, sweet fragrance. 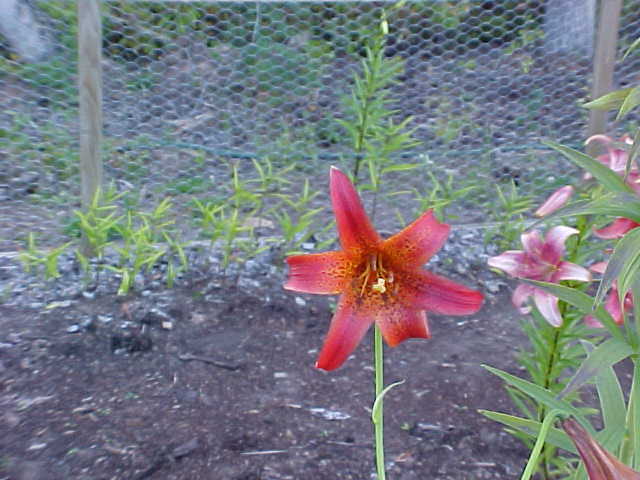 The pictured plant is growing in a raised bed in NW Oregon, covered from mid-November to mid-February. 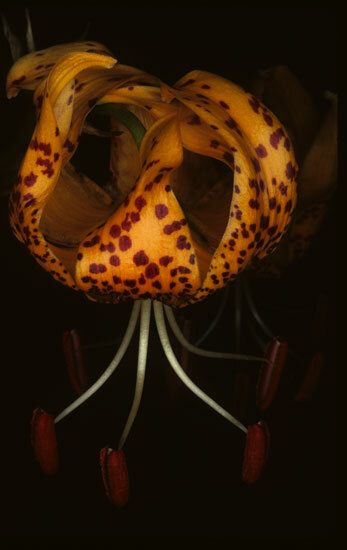 First photo by Jane McGary. 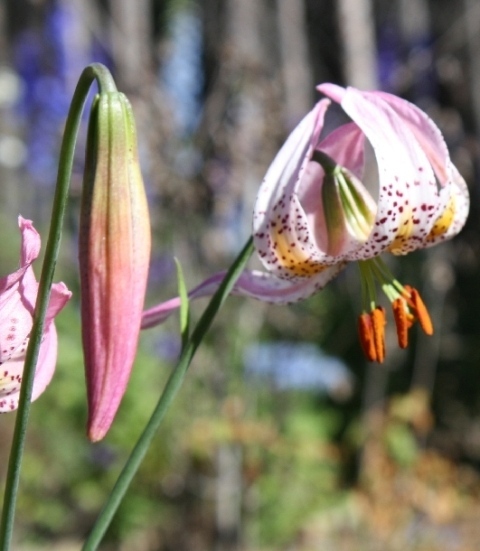 The next two, by John Longanecker, are of a potted specimen grown from seed gathered in Kneeland, Humboldt County, CA. 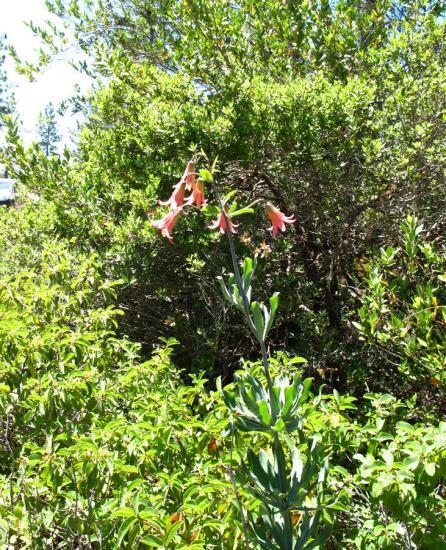 where it grows in a fog drip zone at 1700'. 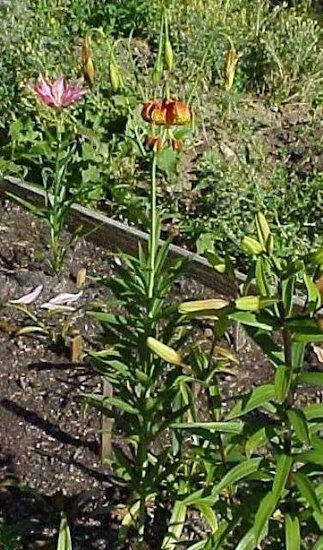 It was grown in Placerville, CA. 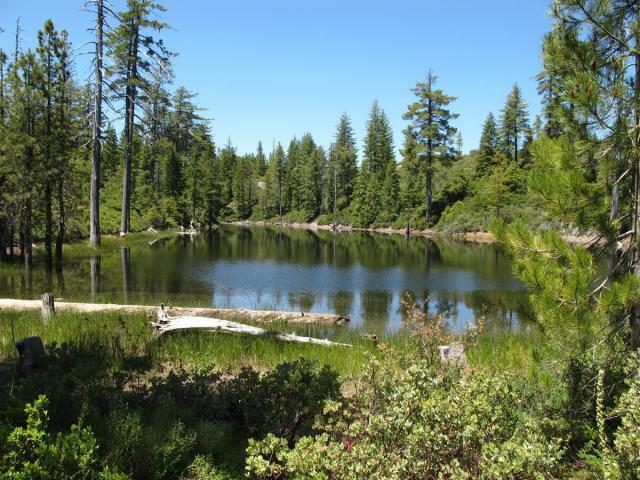 El 2240' zone 7 banana belt. 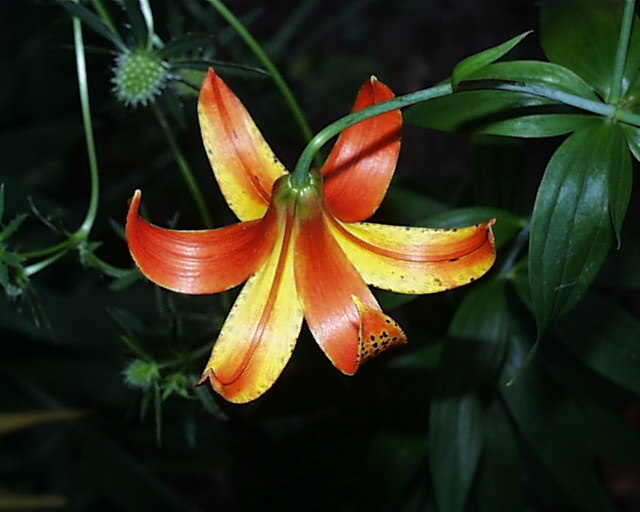 Photos four and five taken by Mary Sue Ittner are of garden plants blooming from seed. 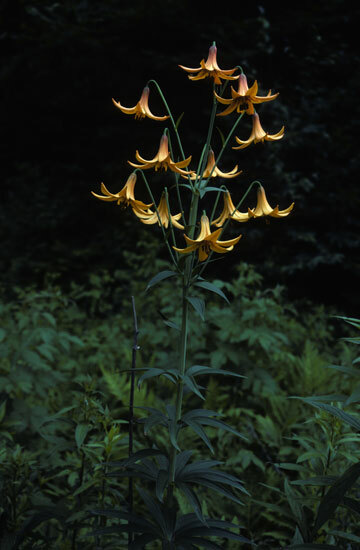 Photo 6 of bulbs by Pontus Wallstén. 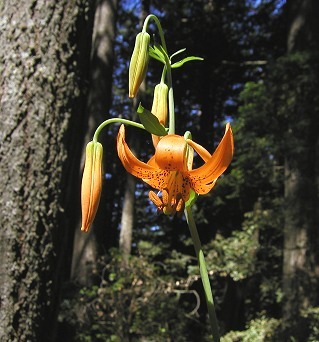 Photos taken by Ron Parsons of plants in situ in Humboldt County, California. 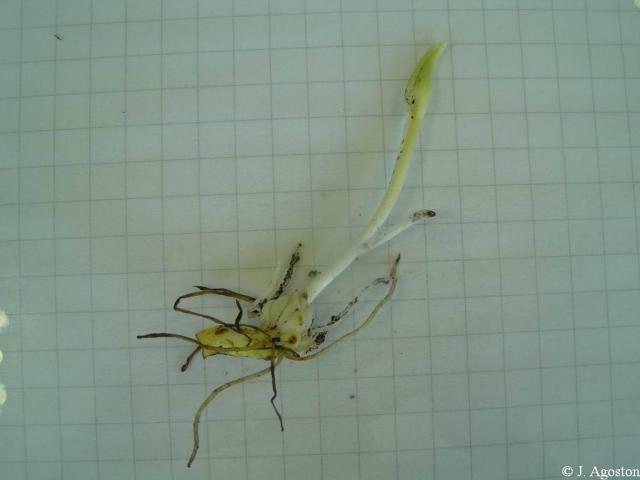 Photos by Darm Crook of several seedlings' first flowering; photo one shows a first day open floret, photo four shows the same floret on day ten; the last photo shows a floret on day 13, the last day it had any tepals left. 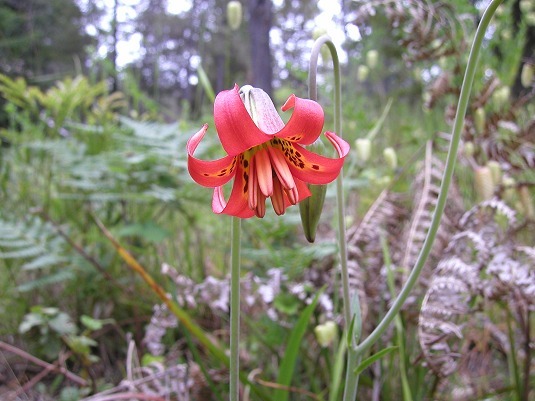 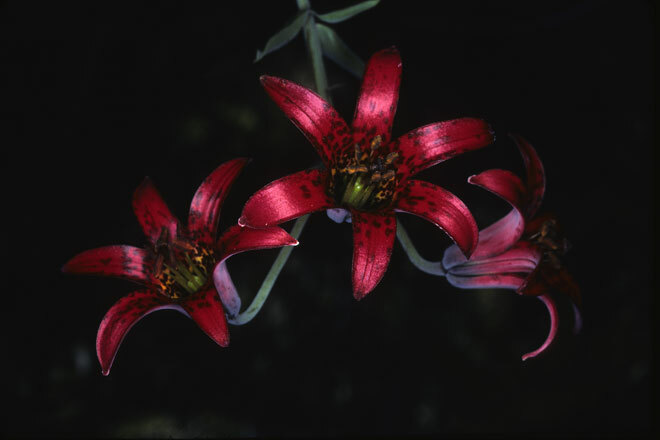 Lilium maritimum Kellogg is a rare lily with red tubular flowers and is found in California in the southern part of the North Coast ranges where it is found in scrub, fens, or gaps in the closed-cone forests, usually in low places where it stays wet longer. 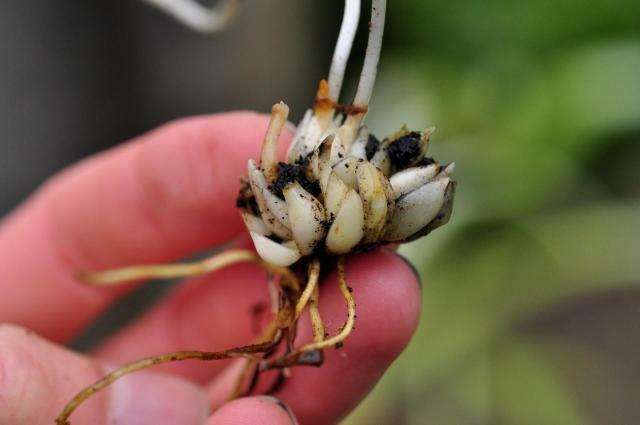 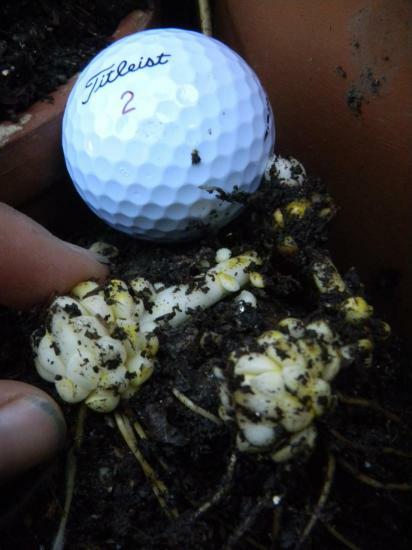 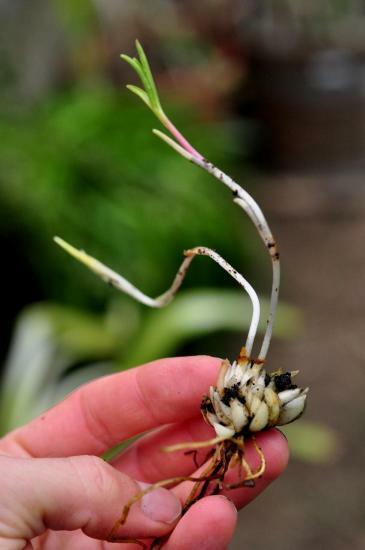 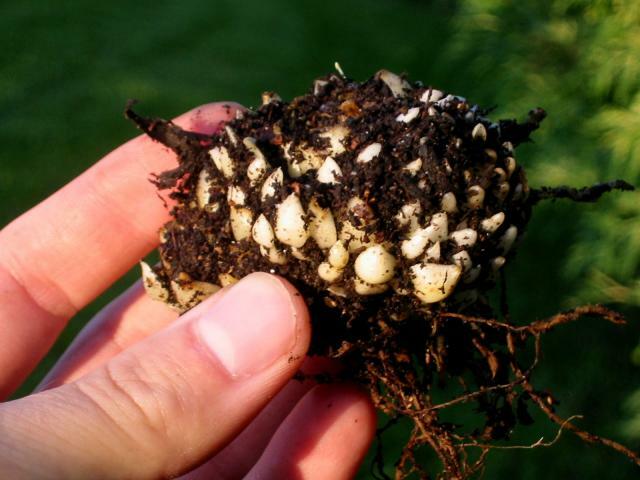 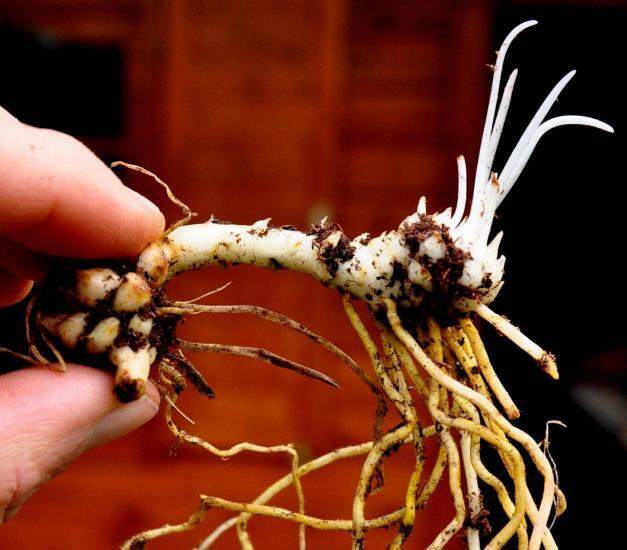 Germination is cool hypogeal; small bulbs are formed in winter and leaves appear in spring. 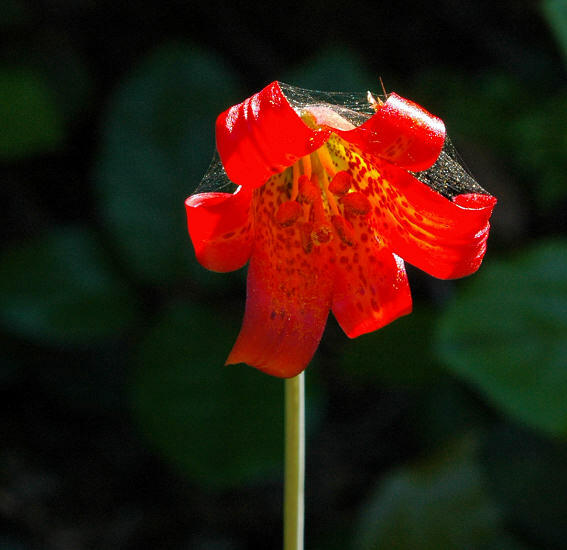 The first two pictures were taken by Bob Rutemoeller near Gualala, California. 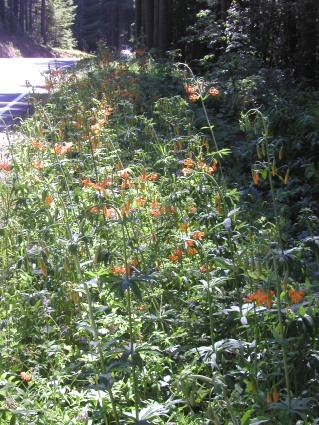 The next two by Mary Sue Ittner were taken of plants in the road verges in Mendocino County. 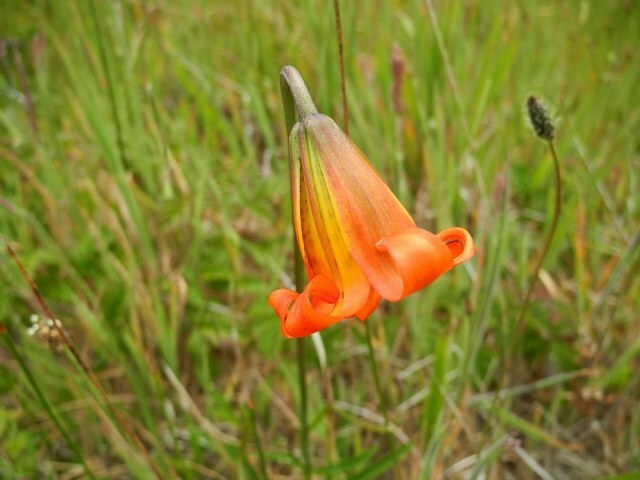 Photos below of a different color form were taken by Mary Sue Ittner at the Point Arena-Stornetta Unit of the California Coastal National Monument. 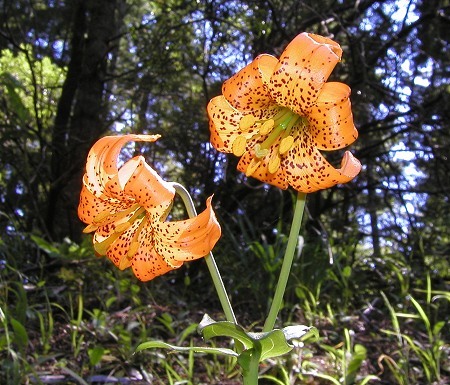 The first photo was taken by Ron Moodycliffe in a paddock near Ft. Bragg, California and the second by Ron Parsons Sonoma County, California. 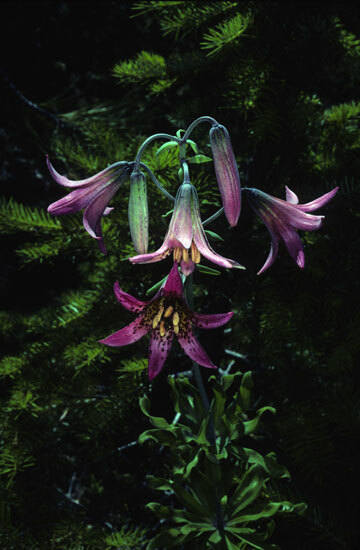 The last two are photos of bulbs by Pontus Wallstén. 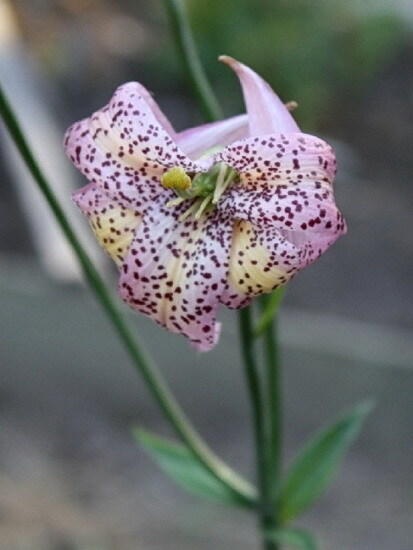 Lilium michauxii Poir. 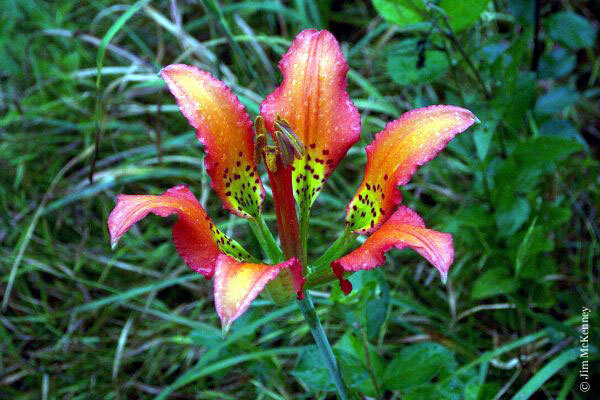 is native to Virginia, the Carolinas, Georgia, Alabama, Louisiana and Florida in the United States. 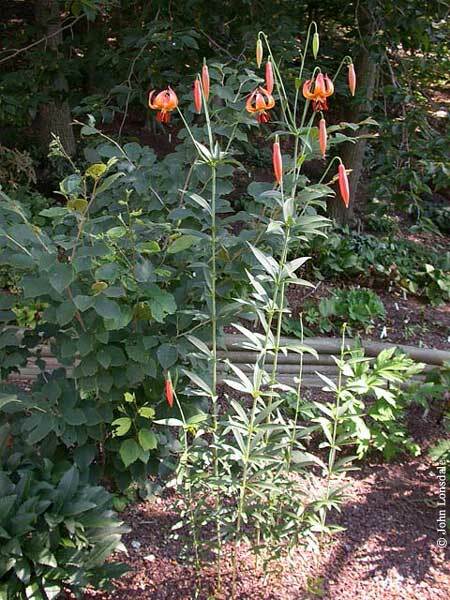 It likes dry, well-drained soils. 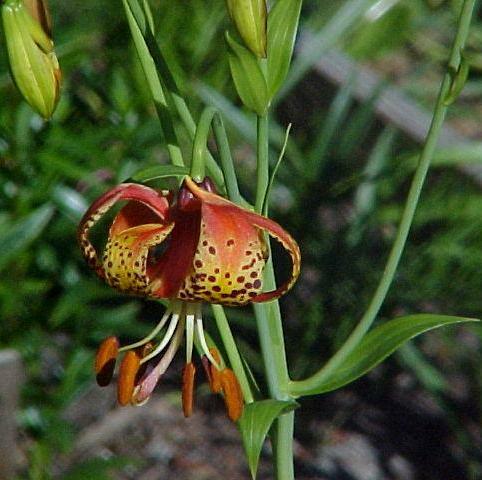 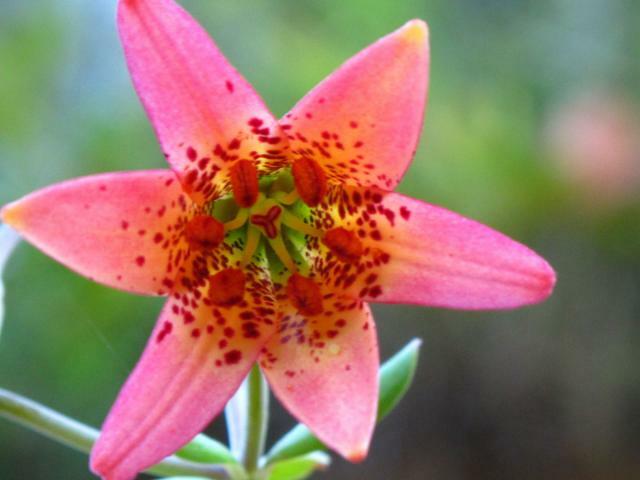 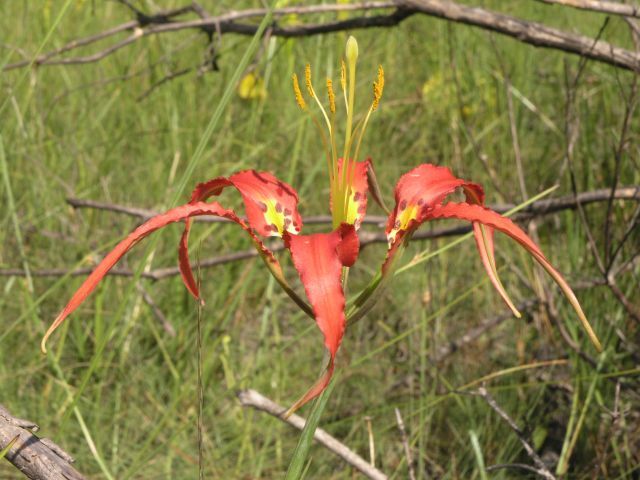 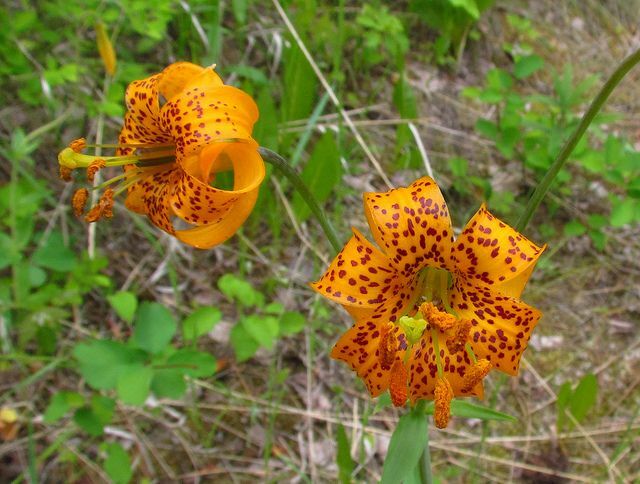 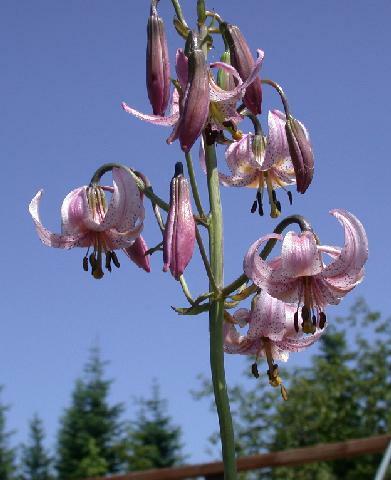 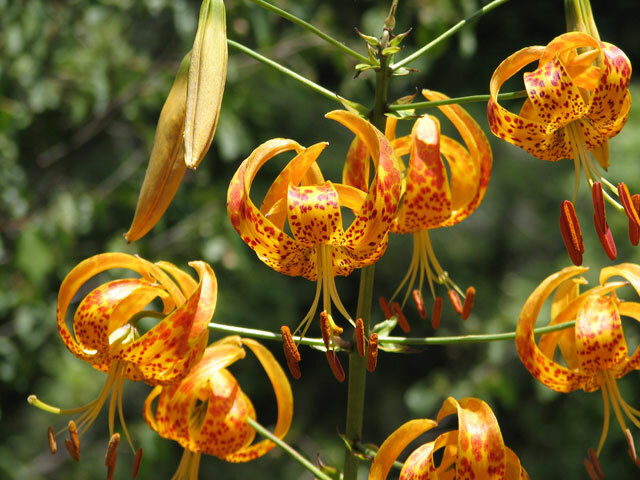 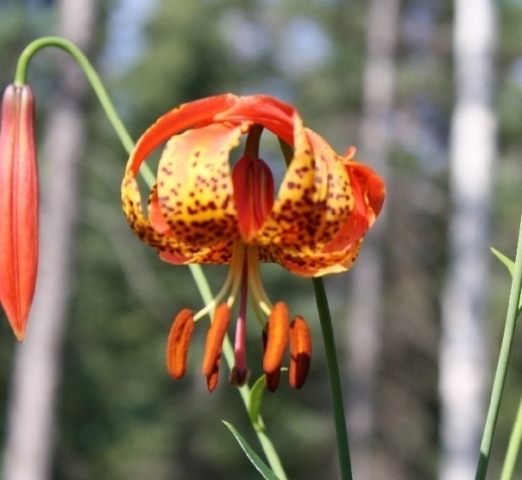 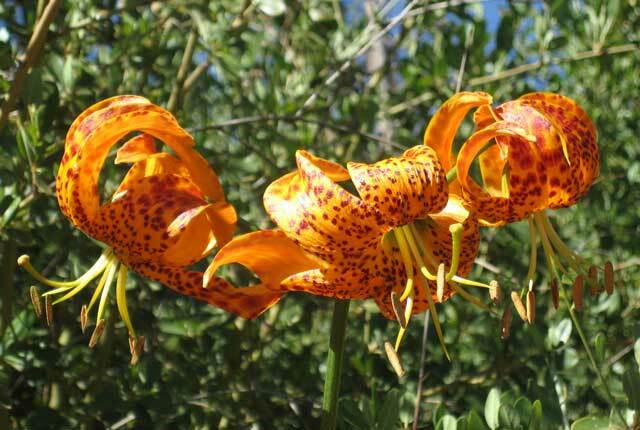 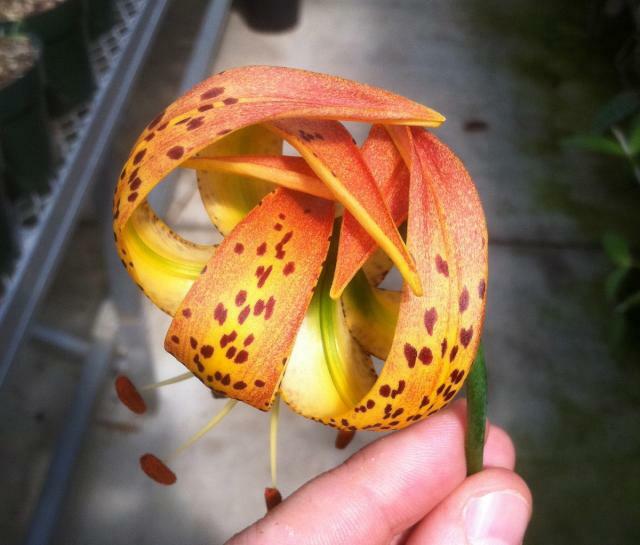 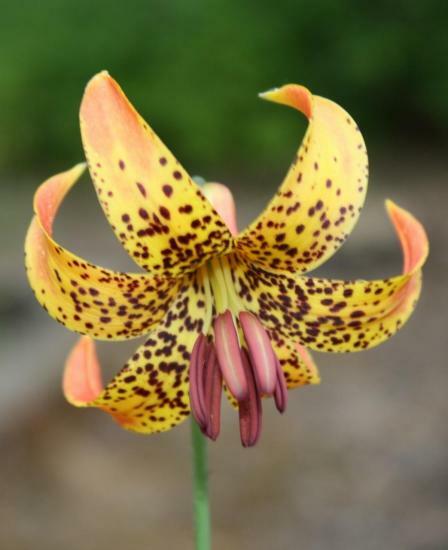 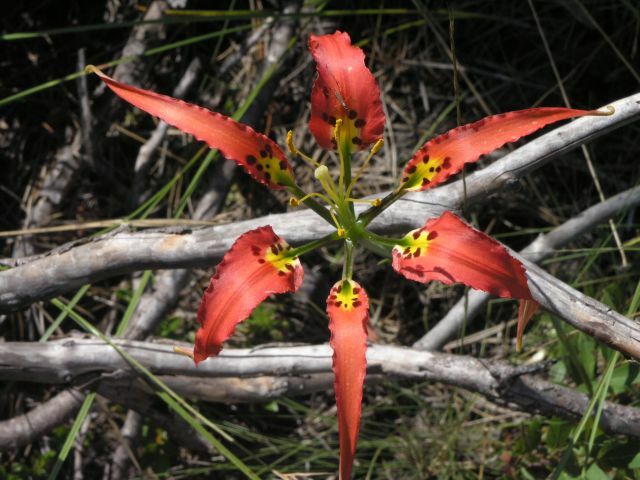 It is commonly called the 'Carolina lily'. 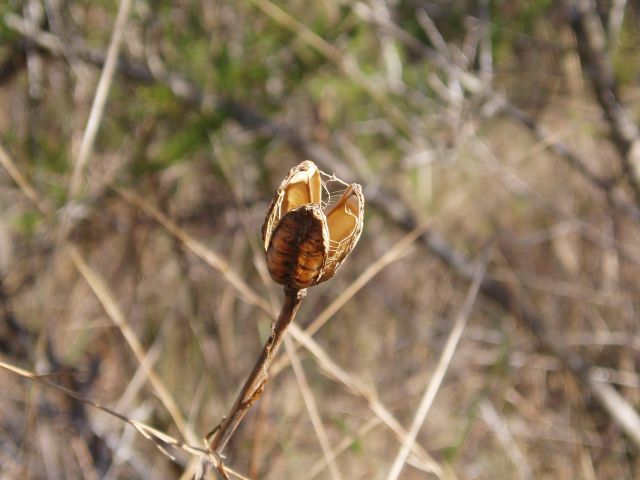 Photos 1 and 2 taken in Tyler County, Texas by Justin Smith. 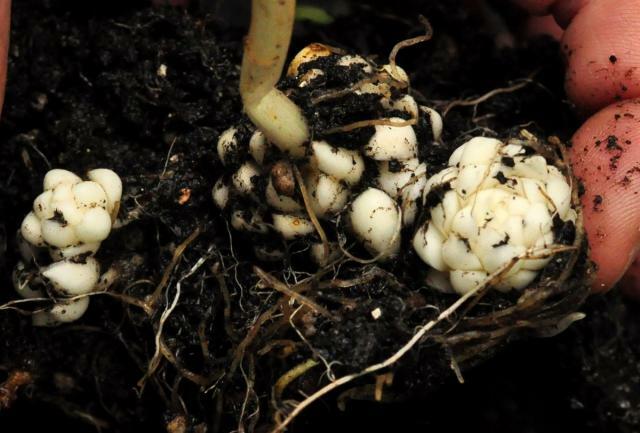 Photo 3 of rhizomateous roots by Pontus Wallstén. 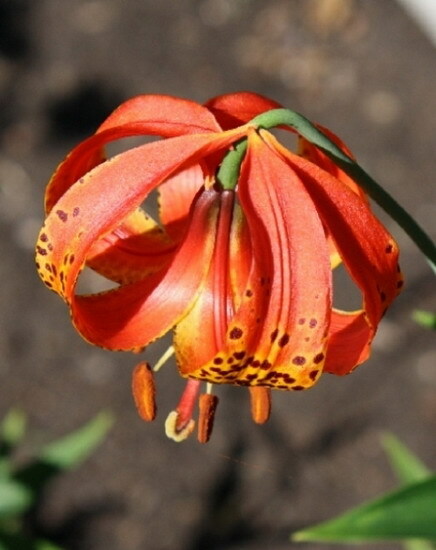 Lilium michiganense Farw. 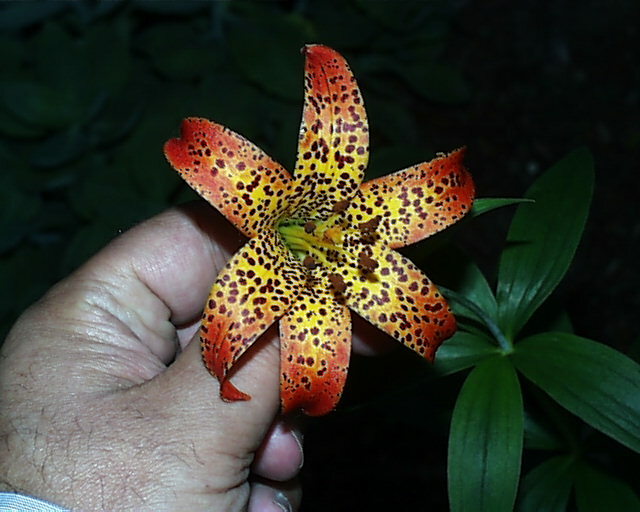 is found in Michigan, Wisconsin, Ohio, other eastern areas of the United States and Southern Ontario Canada. 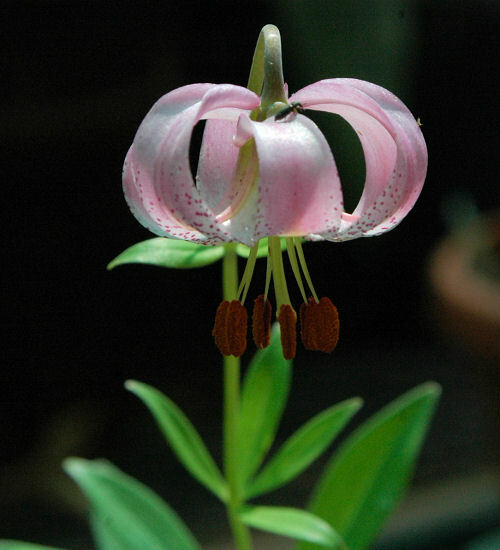 It prefers moist acidic soils. 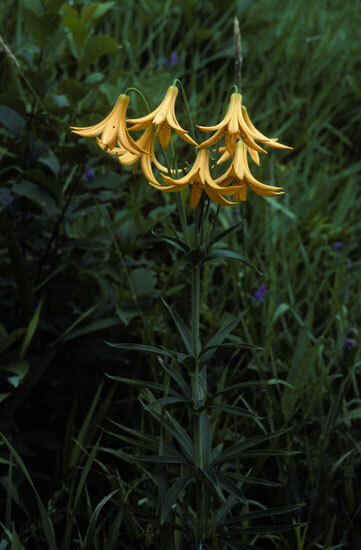 Photos 1-2 by John Lonsdale. 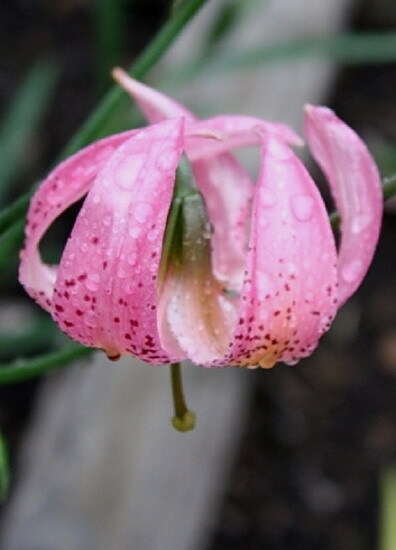 Photo 3 by Darm Crook. 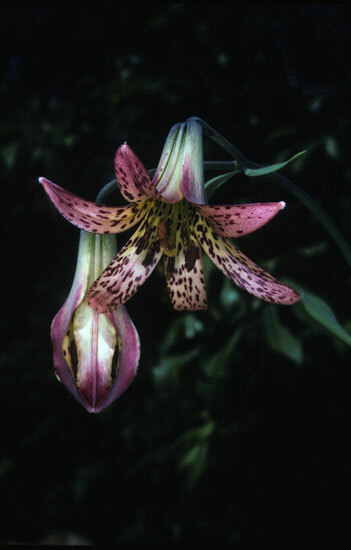 Photo 4 of a bulb by Pontus Wallstén. 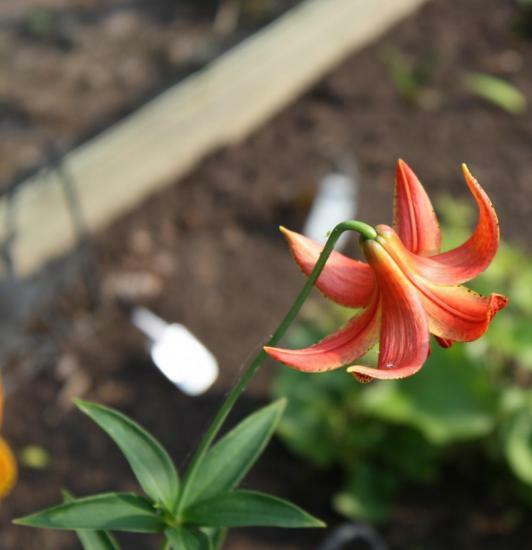 More photos from Darm Crook.